What does it mean to be the City With Soul? This is what was on my mind when planning our trip with Visit Jackson to the capital of the State of Mississippi. I only knew of Jackson MS because of its Deep South Blues history and complicated slavery and Civil Rights history. And I knew I loved saying Jackson, Mississippi with that Southern Drawl. But what else would we discover? Did it have enough depth and soulfulness to share to fall in love with? The city of Jackson MS has been the most surprising destination so far on our America Unplugged road trip. We loved it for its diversity of thriving arts and music culture, and open friendly people. I was impressed with how this city has embraced it’s challenging past and is willing to evolve into something better. Oh, and the food. I can’t forget the food in Jackson! We had some of the best food we’ve had so far in the US –fresh, creative with a modern twist on some soulful Southern dishes. 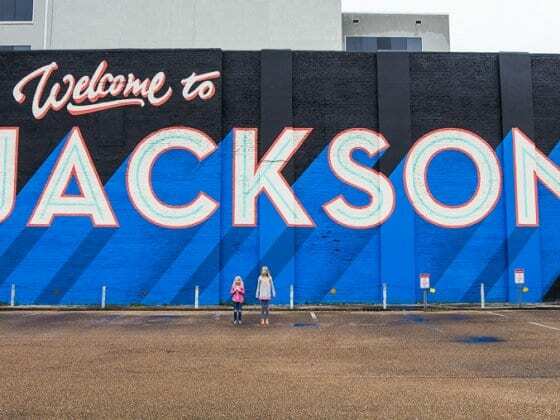 We visited Jackson on a sponsored trip with Visit Jackson to showcase the City With Soul and share their amazing docuseries highlighting the lifestyle and travel experiences on offer, which you can see here. 12. How about a little Southern Soul Pampering? 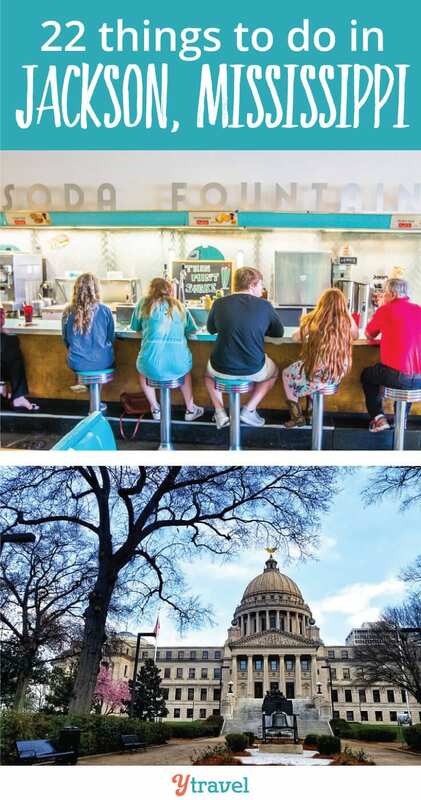 Discover the City with Soul with these fun things to do in Jackson, MS. 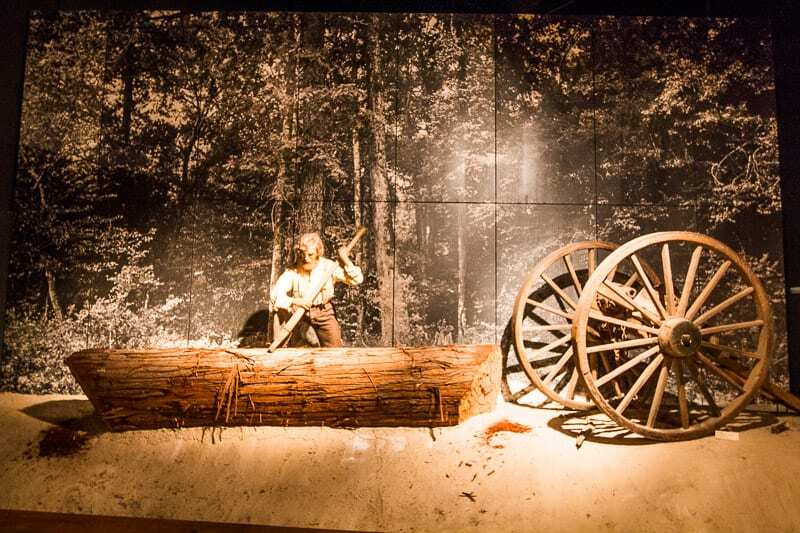 The history and culture of Jackson is complicated, inspiring, humbling and thought-provoking. 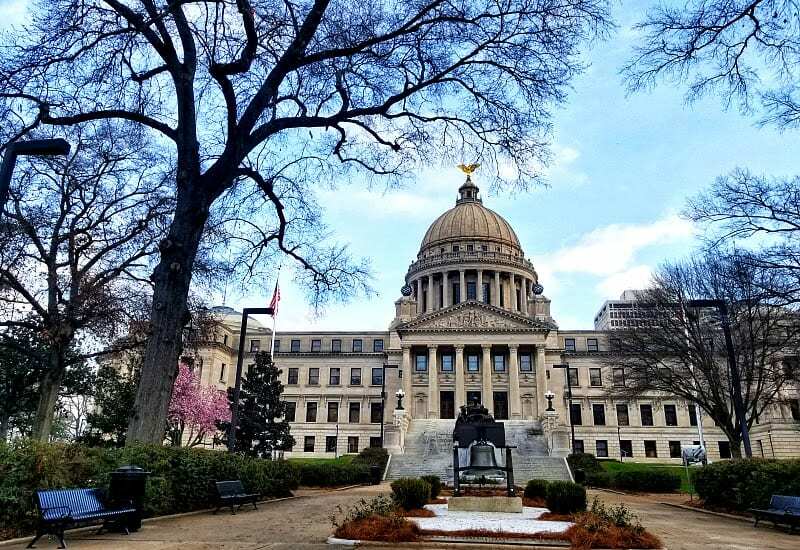 Founded in 1821, Jackson was named after Andrew Jackson, and quickly became the political, economic, and social activity, and has a rich civil war and civil rights history. 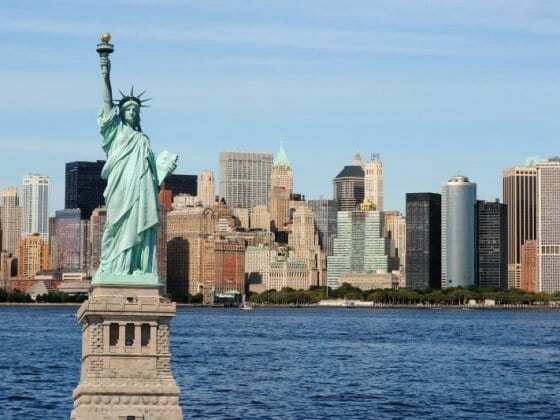 You can learn all about it and how it has evolved into this exciting destination at the following places. 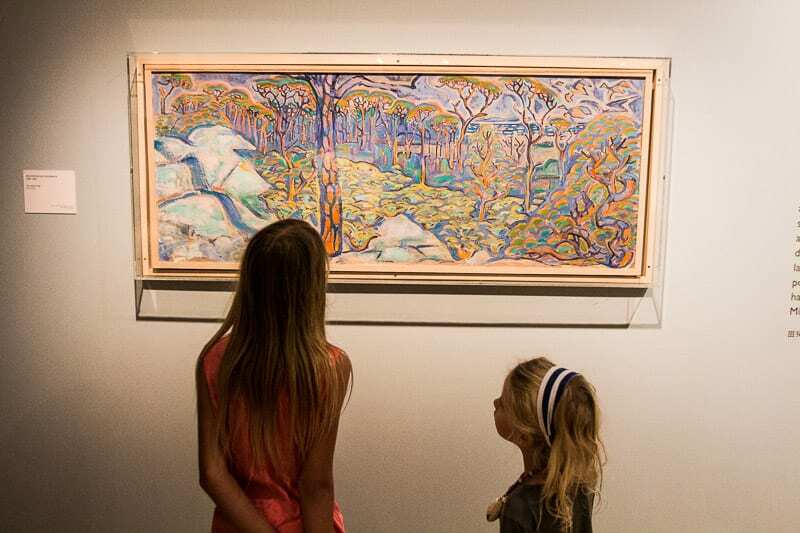 The Mississippi Museum of Art is a community supported institution for over 100 years. 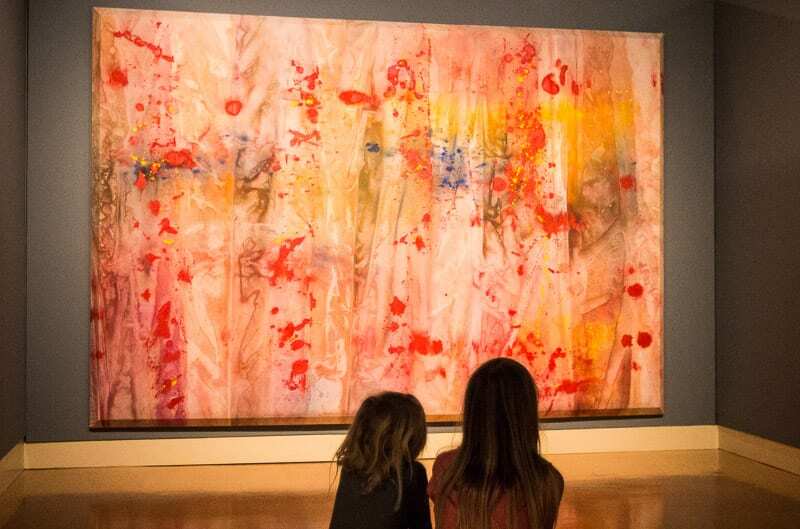 It’s not just about the stunning art collection, but it’s a vibrant cultural center that offers outside movies, bands and food trucks, and the café inside is meant to be stellar. 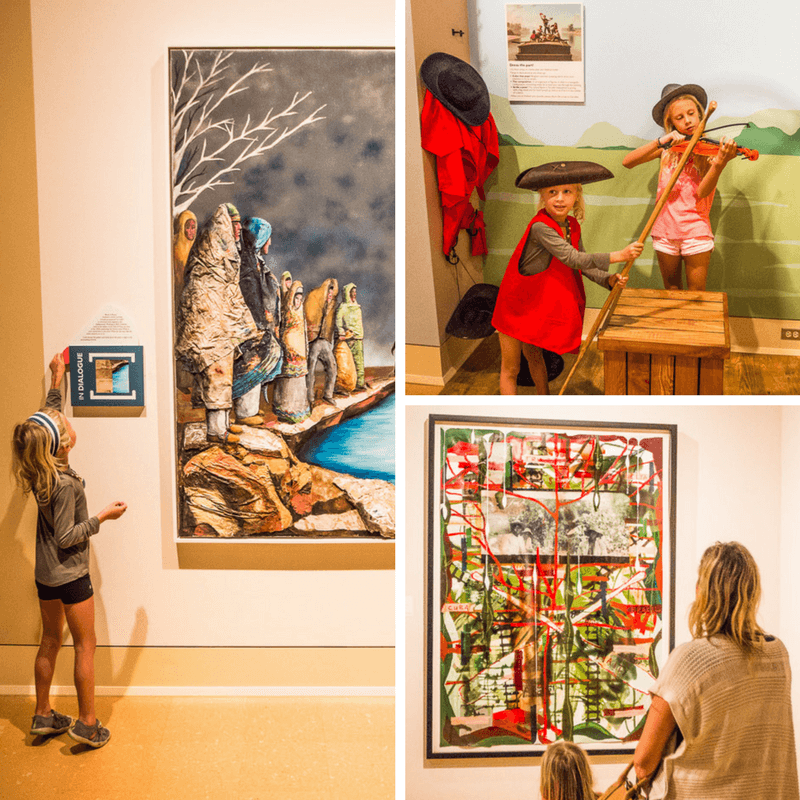 We only experienced the art within the museum, which features a lot of local and national artists and brilliantly tells the story of Mississippi. I love the blend of old and modern art within each section of the museum, which is broken down into historical timelines. I was super impressed with the quality of the art collection. We were led through the museum by two teaching fellow students who helped us gain more from the pieces with the background stories and additional insights those with a trained artistic eye can see. I love how there are interactive sections for the kids and my girls, not used to art museums, really enjoyed it. 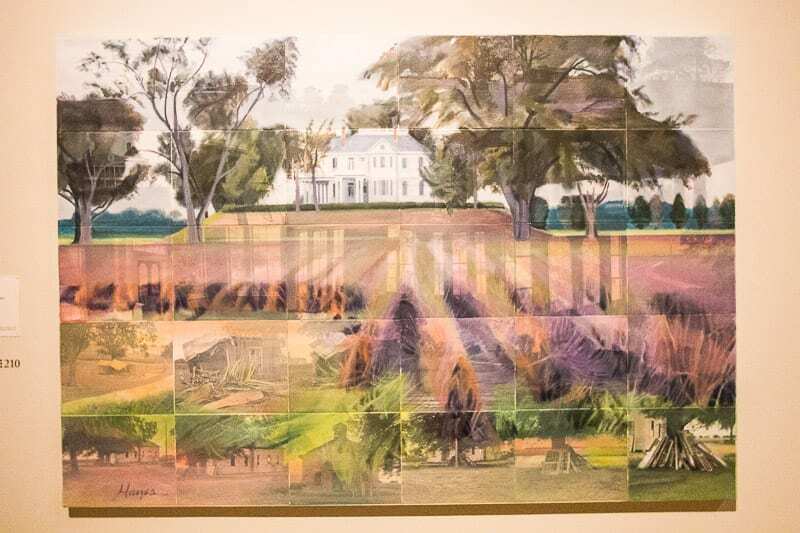 White Gold by Thomas Sayre is an immersive site-specific installation, which depicts the cotton-filled Southern landscape, Mississippi is most known for. I loved Red April, the tie-dyed canvas artwork that drew you down the hall in the Civil Rights Section depicting the assassination of Martin Luther King. This painting of the relocation of Native Americans is also mesmerizing. Looking for fun things to do in Jackson, MS? Okay, so we’ve been to a few Children’s Museums in our travels. But the Mississippi Children’s Museum in Jackson was by far the best we’ve been to. Firstly, the spacious, light and bright design of it draws you in and opens the right framework for learning and engagement. I didn’t realize how important this was until I walked in and felt it. 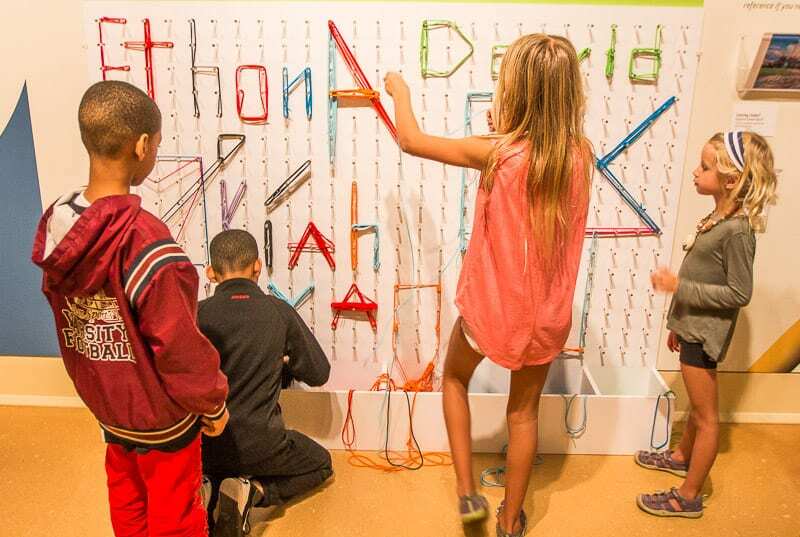 The Museum has a mission to improve health, literacy and overall well-being for children and the activities reflect this. It’s highly engaging, creative and educational. 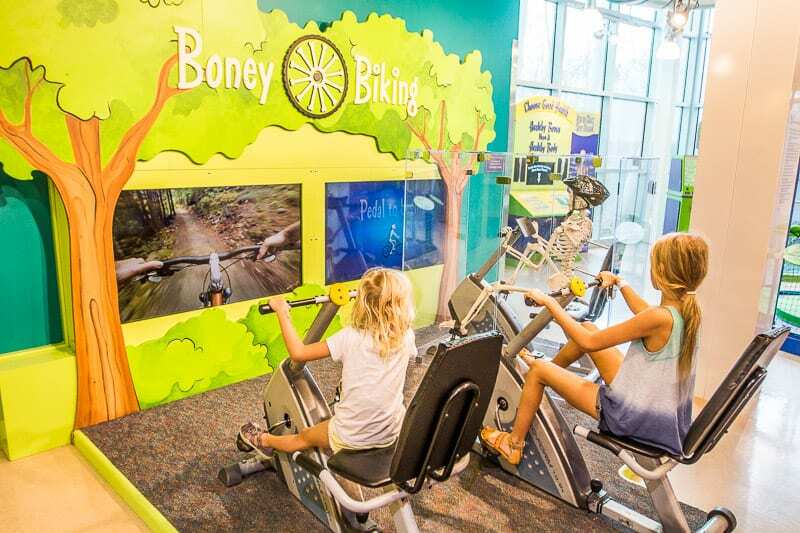 There are climbing walls, a real car you can pretend drive, a giant scrabble board and cycling skeletons. There is a music and dance room where you can create and record, and an art room with volunteers teaching art lessons. And there is a large digestive system (i.e. 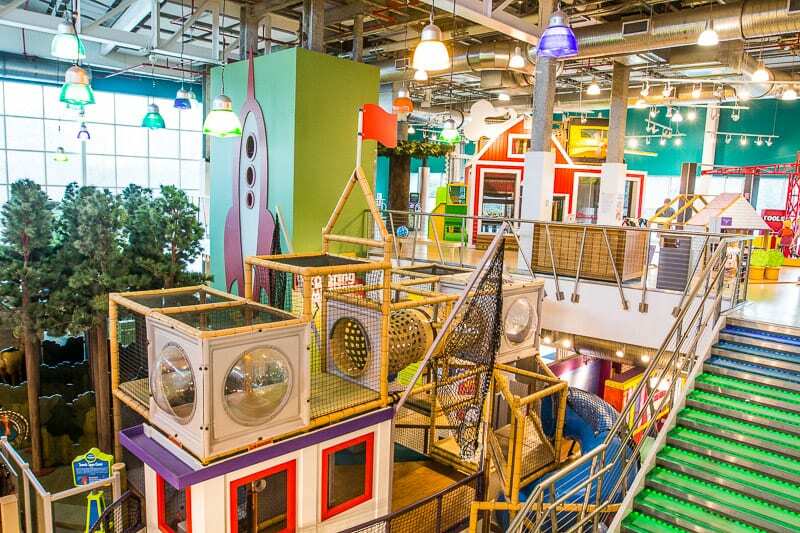 giant tunnel playground) that gurgles and farts as you move through it until you poop out the end in the toilet bowl!! There’s also a Literacy Garden outside which is a 13,000 square feet garden and playground with artworks, fountains and climbing towers. 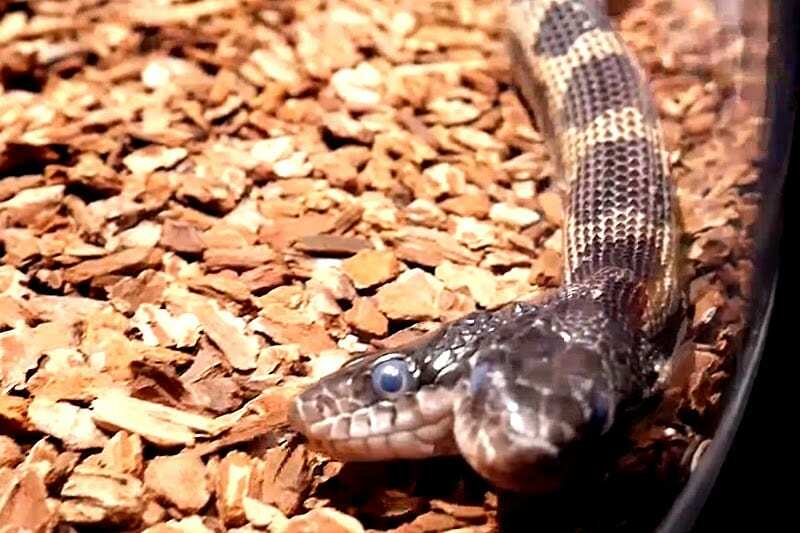 We will always remember the Mississippi Museum of Natural Science for the two-headed snake. Have you ever seen one before? Me neither and it freaked us all out! Apparently, the snakes were twins in the egg but stopped the splitting process, and so now they are one with two heads. 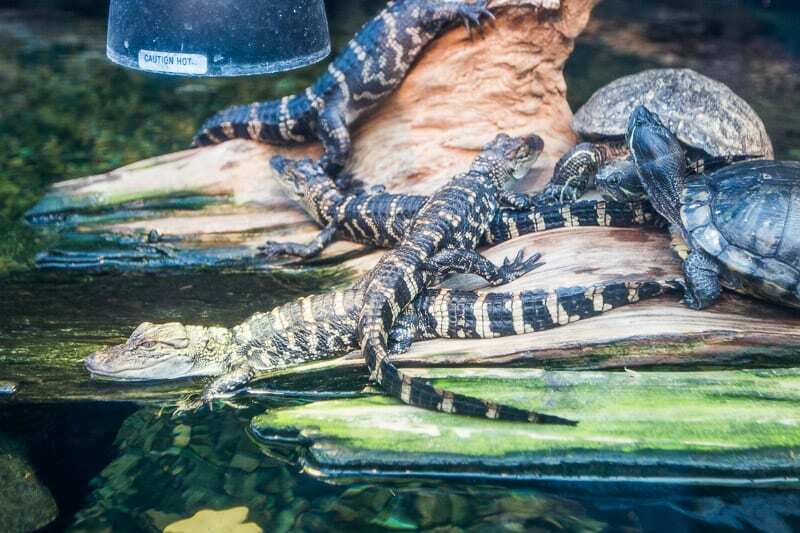 There are plenty of cute alligators and turtles to look at too and a great section on energy conservation which lead a discussion on what we can do better in our lifestyle. If you want to stretch your legs, there is an outside area with a few walking trails. The Agricultural Museum is on a large block of land and has a small historical town, farm animals, a large indoor model train display, cotton bales, old crop dusters, and more. My girls enjoyed the printing room the most. We learned how printing is evolved, they had the opportunity to use an old printing machine and learned how phrases such as mind your p’s and q’s came from the old style of printing. It’s just so easy to produce words for others to read now with the online world! Note to self: Never complain about how hard blogging is again. 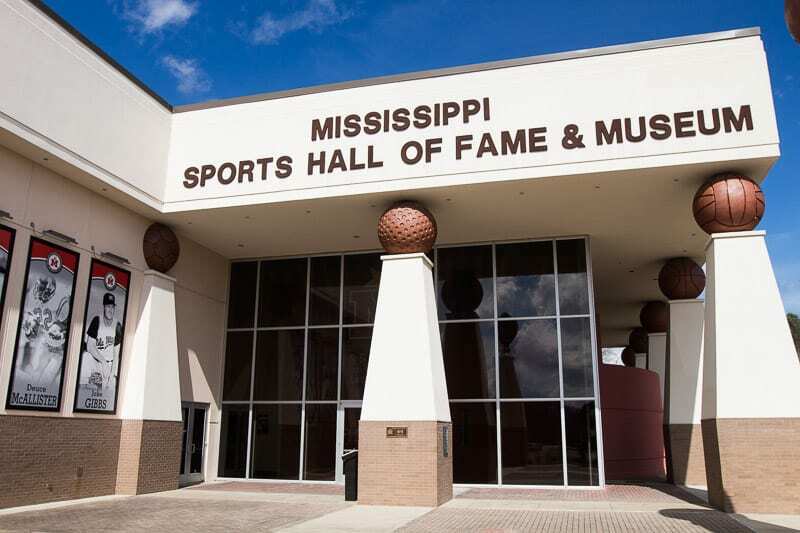 If you’re a sports fan, this is one of the best things to do in Jackson, MS. 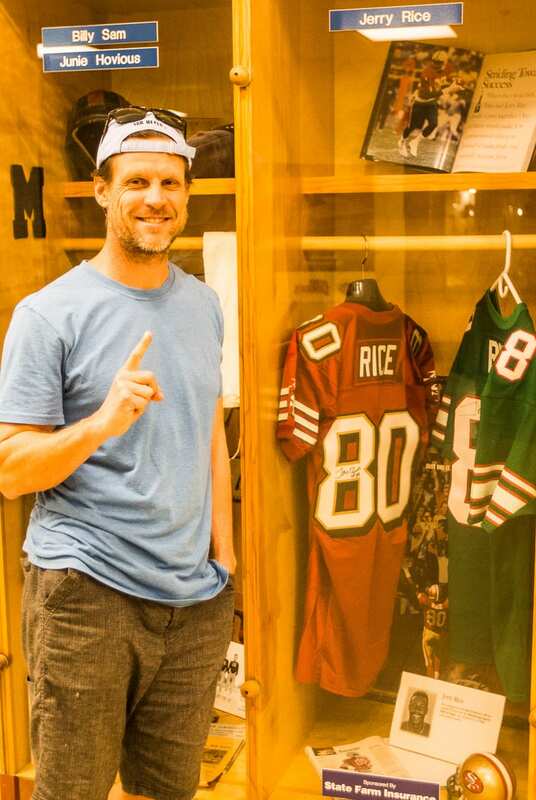 When I first met Craig, I knew about Jerry Rice about an hour into our conversation. He’s been his sporting hero for many years. 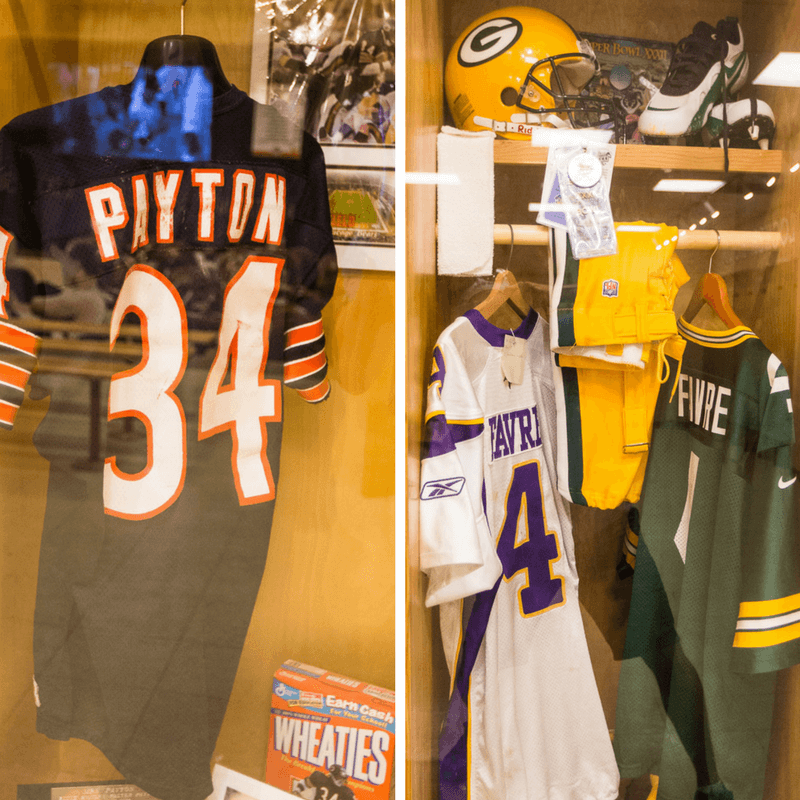 So it was quite a thrill for him to visit the Mississippi Sports Hall of Fame and Museum, where Jerry Rice, alongside a few other Mississippi sporting legends, like Brett Favre, Walter Peyton, Archie Manning and Dave “Boo” Ferriss are recognized. 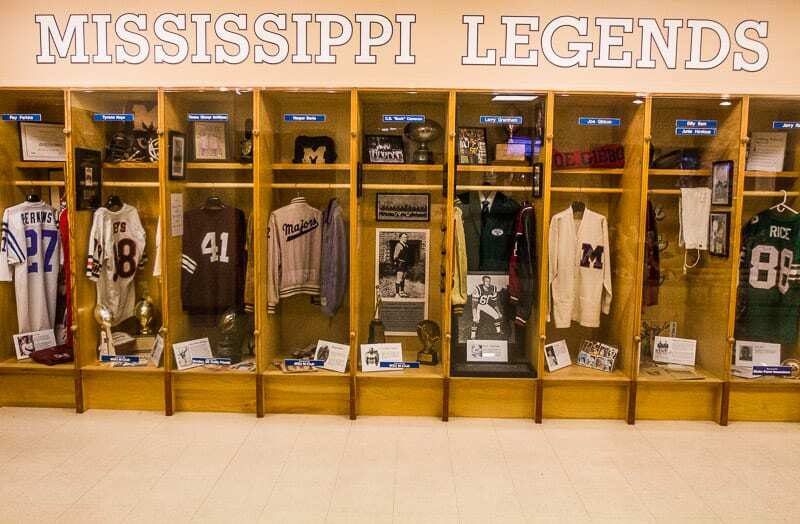 Start with the short video so you can learn just how important sports are to the state of Mississippi and how many sporting legends come from there. 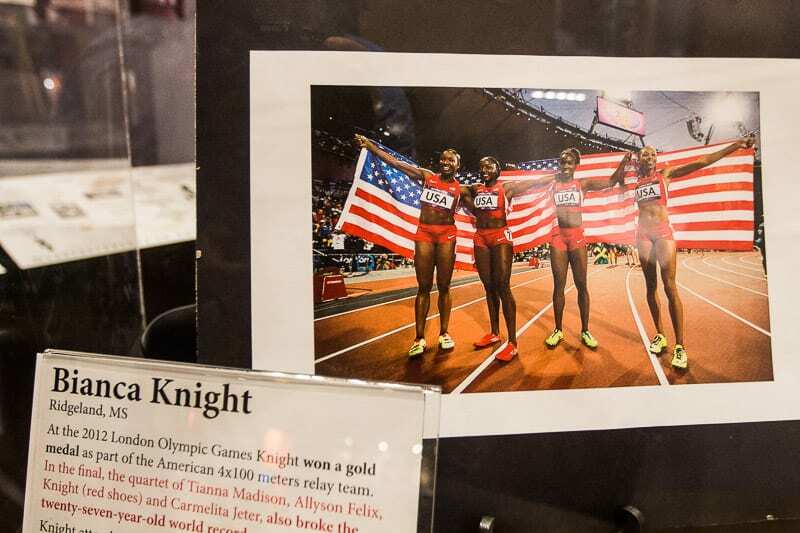 There are some Super Bowl MVP trophies, Olympic gold medals and more all on display, for you to ‘ooh’ and ‘aah’ at! The girls liked cartwheeling about in the replica baseball stadium and racing on the short sprint track. Again, Jackson Mississippi knows how to put together an engaging and interesting museum. 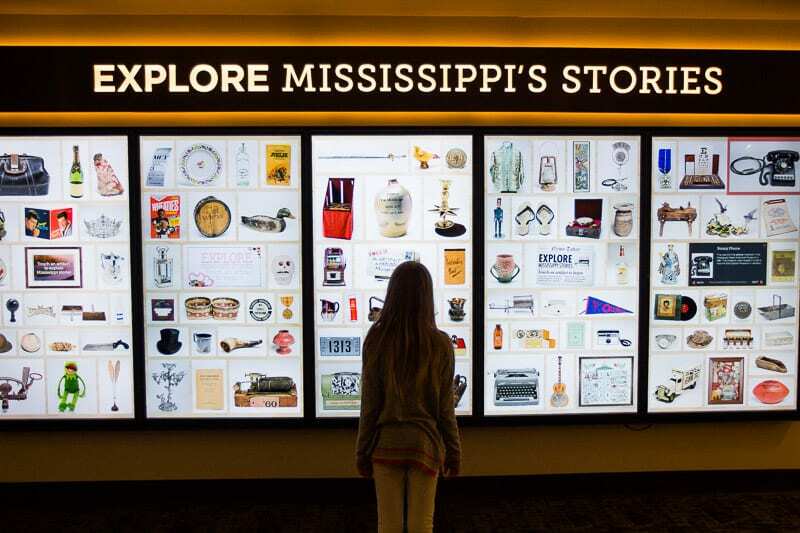 The Museum of Mississippi History is in the same building as the Mississippi Civil Rights Museum, and together they are known as the Two Mississippi Museums. 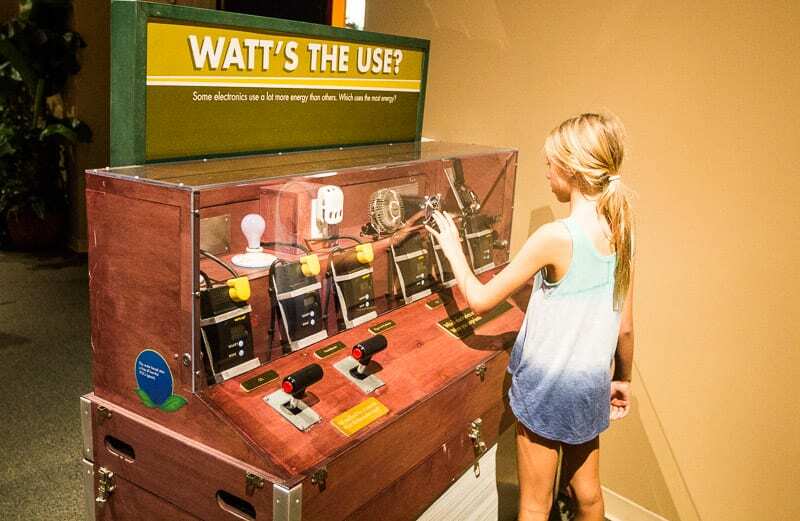 They were both only opened in December 2017, which means the displays are modern, engaging and interactive. You can tell they’ve learned how to do a museum right. They are quickly becoming known as the best things to do in Jackson, MS. 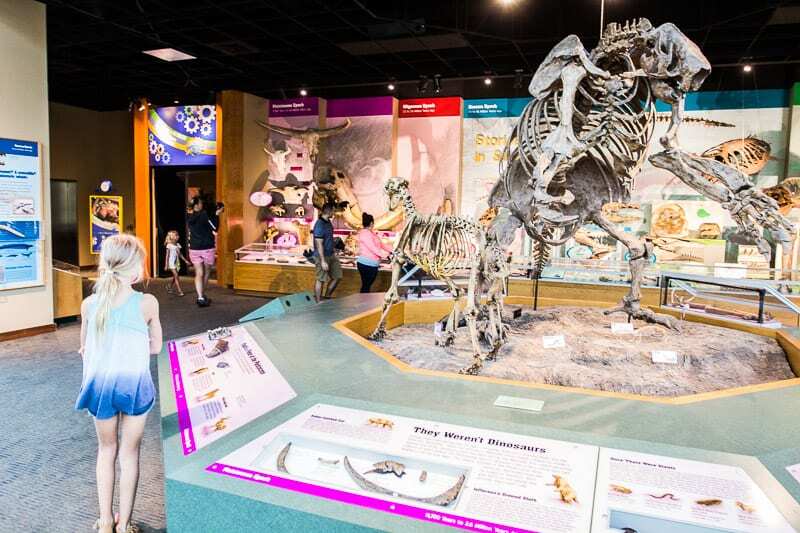 I was expecting the girls to be whining about being bored as soon as we entered, so I was shocked to see them race from one display to the other taking a keen interest, engaging with the story and interactive exhibits. 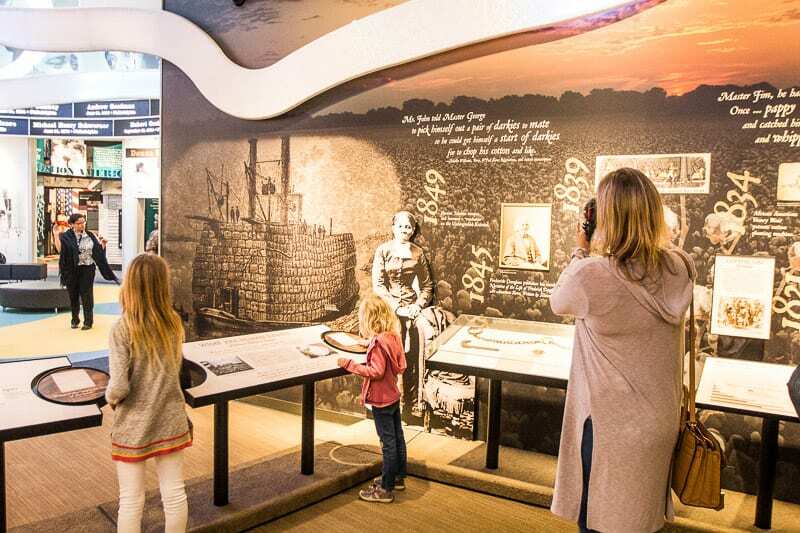 Videos share stories of specific historical events throughout the museum if you want to deepen the experience. The girls loved the Reflections section at the end where you’re invited into the recording room to share your own history stories. Be prepared. 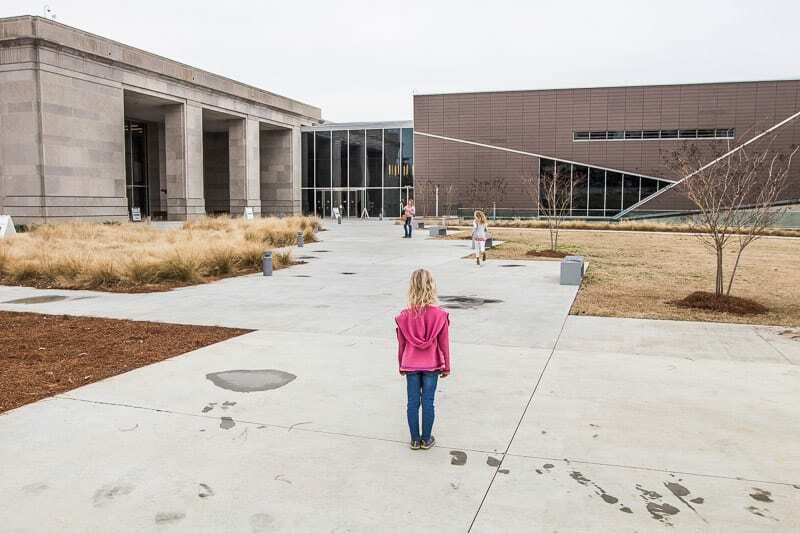 The Mississippi Civil Rights Museum can be a little overwhelming. There is a lot to take in, much of it traumatic. There is a section in the museum on lynching, which we were warned about regarding the girls. There’s a curtained section with some disturbing footage about it, which we skipped. It’s a brutal story that cannot be glazed over though. It’s important to remember the past and use it as a reminder of how to be better. 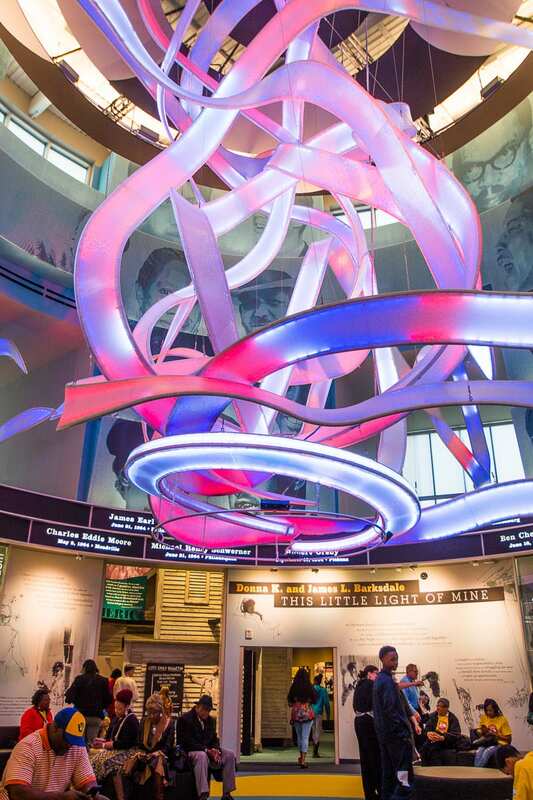 This monument to the heroes and martyrs of the movement shows how willing the people of Mississippi are to embrace the pain of the past to heal and move forward. 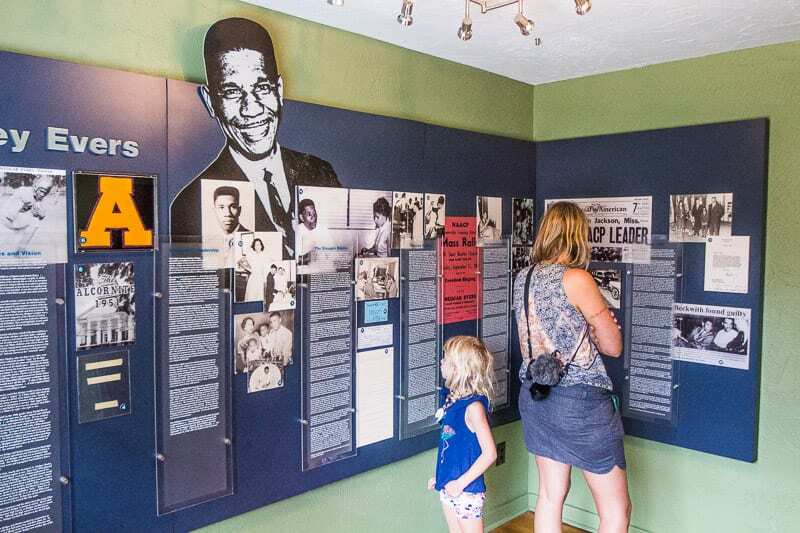 We had been following the Civil Rights Trail a lot on our travels, in Memphis and Montgomery, so it was great to further deepen the story and learn about some new heroes like Medgar Evers. 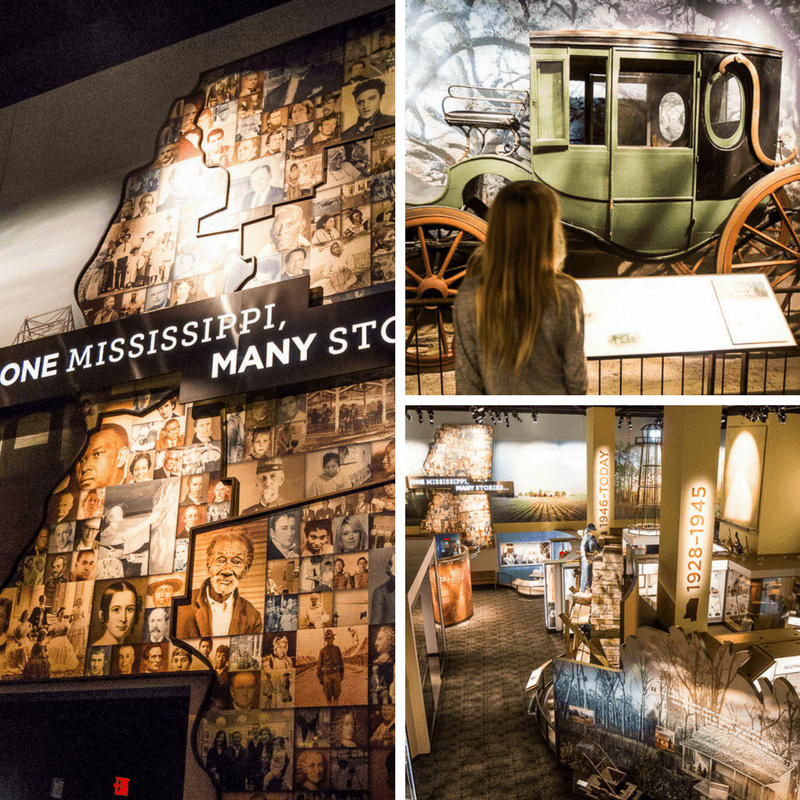 If you’re in the city to visit the museums in Jackson, MS, don’t miss this one! I was surprised I did not know anything about Medgar Evers, and I am glad that I learned about his Civil Rights activism. 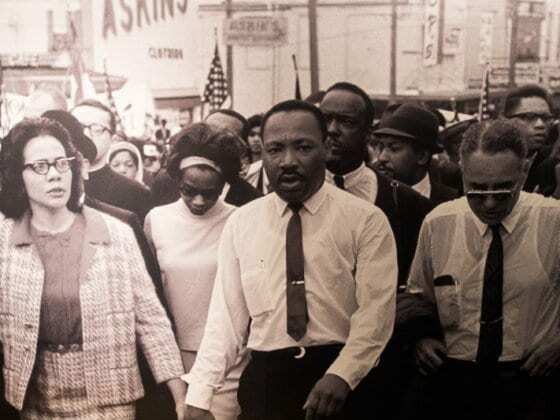 He was a significant and influential Civil Rights leader in Mississippi. He tirelessly worked to overturn segregation and maintain voting rights for African Americans and was the Field secretary for the NAACP. As a result, his life was constantly under threat, and sadly he was brutally assassinated in his driveway in 1963 by a white supremacist. You can take private tours of his house organized through Tougaloo University. 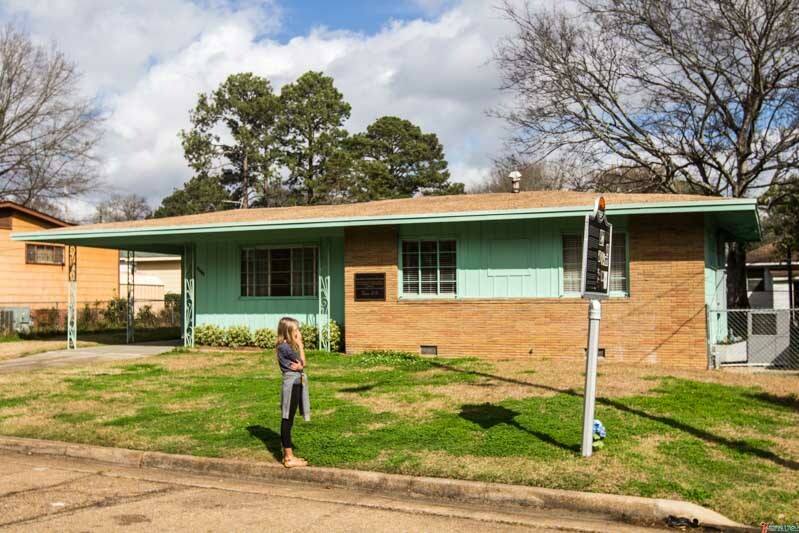 His house is now a national historic landmark and a time capsule for middle-class African American life in the 1960’s. Minnie Watson took us through the home and shared details of Medgar’s early life and career, and we saw the bullet holes from when the bullet went through his chest and into the house ricocheting around the kitchen. You will leave with a heavy heart. Honor those who bravely sacrificed to create a better world. 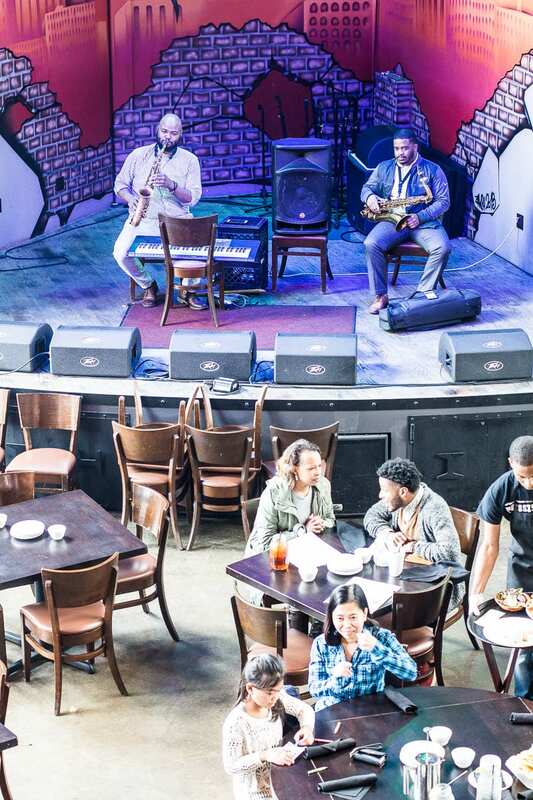 This is one of the coolest things to do in Jackson, MS.
Hal and Mal’s is a Jackson institution for its food and live music. It was opened in 1985 by brothers Hal and Mal in a former 1920s GM&O freight train depot building in the heart of Jackson downtown. It’s quirky and retro interior perfectly matches the warmth of a Southern Blues jamming session, which is what you’ll get on a Monday night at Blue Monday (which is held in the red room of the restaurant). We did not eat here, the kitchen was closed, but we saw plenty of people bringing in their own snacks! 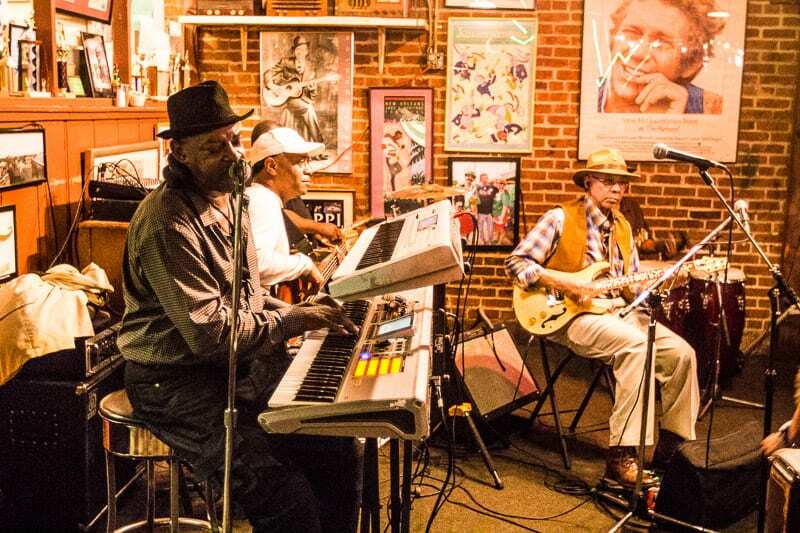 On Mondays for a small $5 cover charge you can experience a blues jamming session w hosted by the Central Mississippi Blues Society. The regular band plays a series of upbeat tunes and then invites members of the audience to get up and sing and play with them. You just never know who might get up. You perhaps? Blue Monday is friendly, relaxed and fun and suitable for kids. 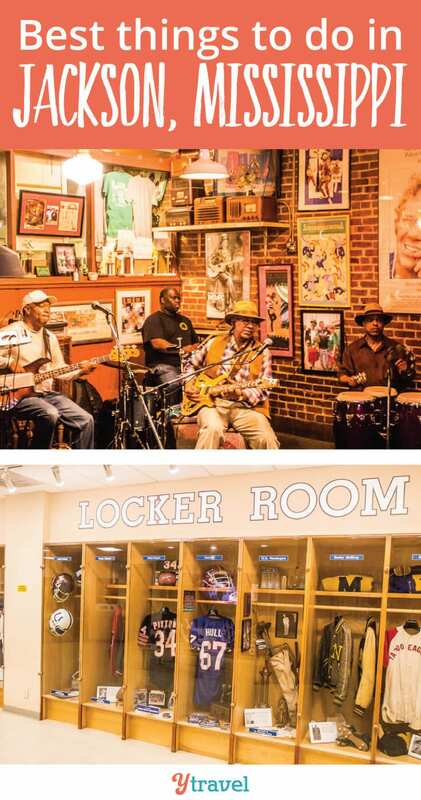 It is one of the most enjoyable and soulful things to do in Jackson, MS. We loved it. 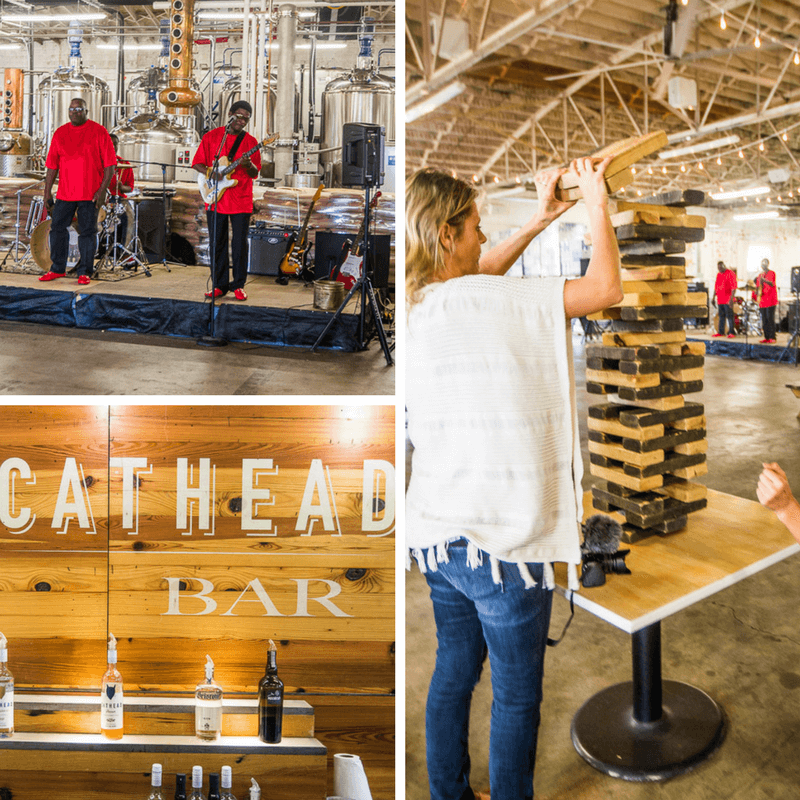 Our first introduction to Jackson was the Cathead Distillery, an old airy warehouse which gives it a hip industrial feel. Wow! Was my initial reaction. This is my kinda place if this is what Jackson is like then I know it’s for me. We arrived for the BBQ and Blues event. Outside sat a food truck where you could grab your BBQ nachos or tacos, and inside were visiting local breweries and a sampling bar of the Cathead liquor. 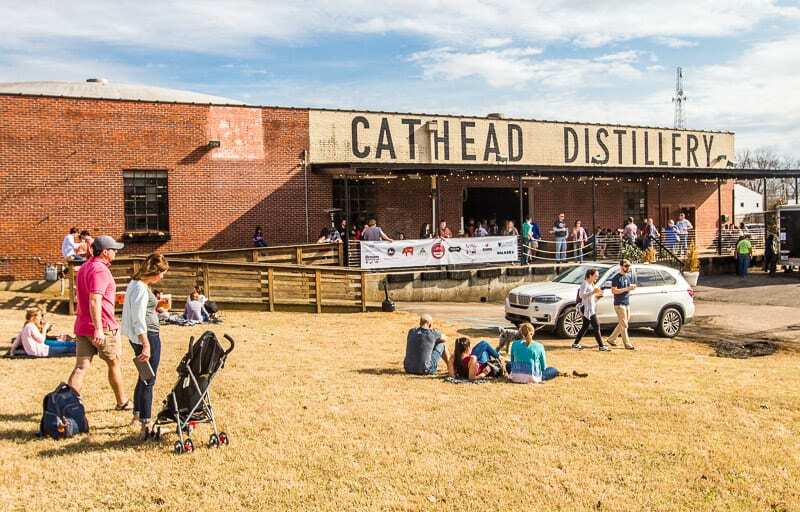 Cathead is the first and oldest distillery in Mississippi. Its name honors the rich musical history. Cathead was a term used by blues musicians as a nod to artists they respect. 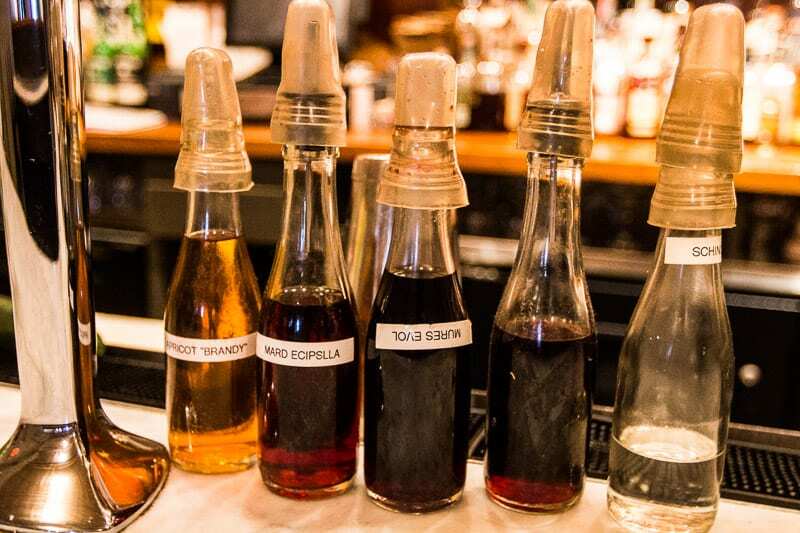 Since its beginning, their vodka (including their honeysuckle and pecan versions) and gin have become baseline bottles for any cocktail bars across the South. The BBQ and Blues event was the perfect place for kids and pets! 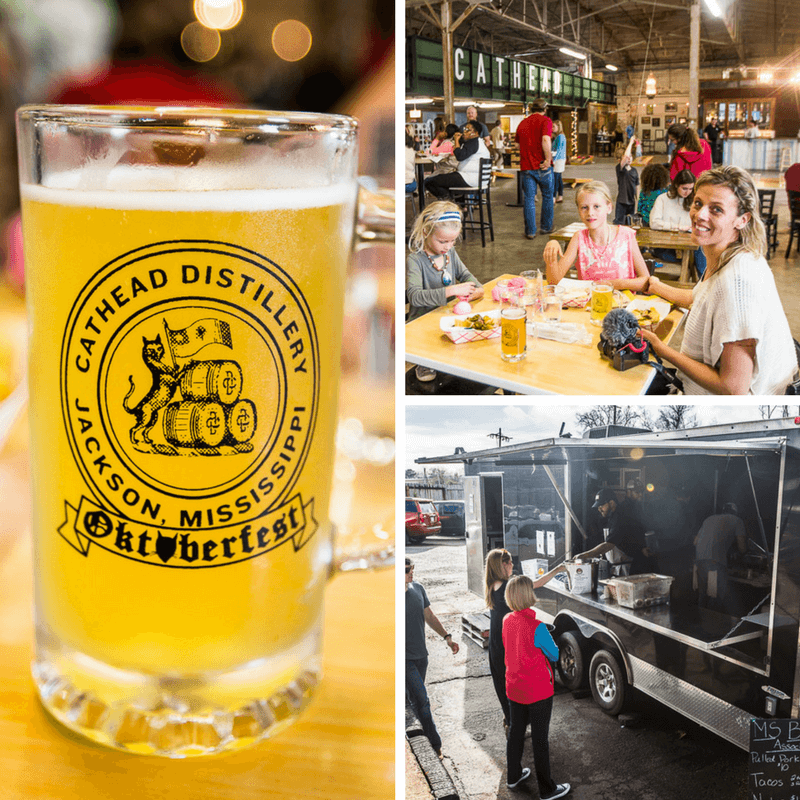 With corn hole, giant jenga and connect 4 games there was a playful and relaxed atmosphere and on the stage in front of the giant fermentation tanks and copper-columned still was a five-piece Blues band playing some upbeat tunes. When we went to leave, we randomly started talking to a fellow, who turns out to be the head distiller of the vodka and once lived in Adelaide. He introduced us to one of the owners, chatted for a bit and gave us a bag of his unique honeysuckle vodka to take home. Welcome to the warmth and friendliness of Jackson. We’d arrived at the right place. 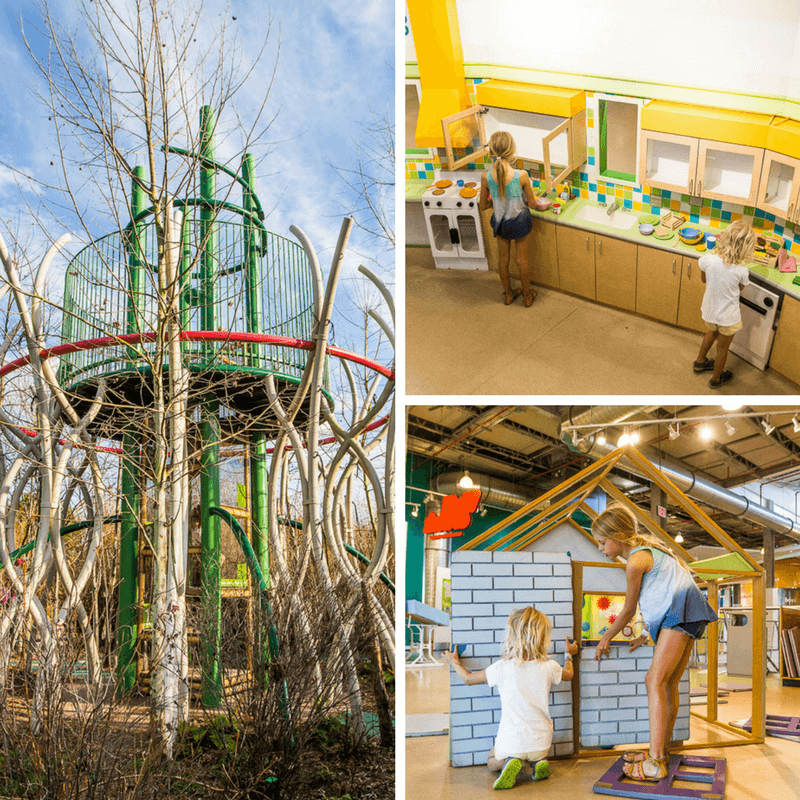 Definitely one of the most family-friendly things to do in Jackson, MS for food and drink. Public hours for tours and tastings are Thursday and Friday 3-6pm and Saturday 1-6pm. Check the website for events, like the BBQ and Blues. 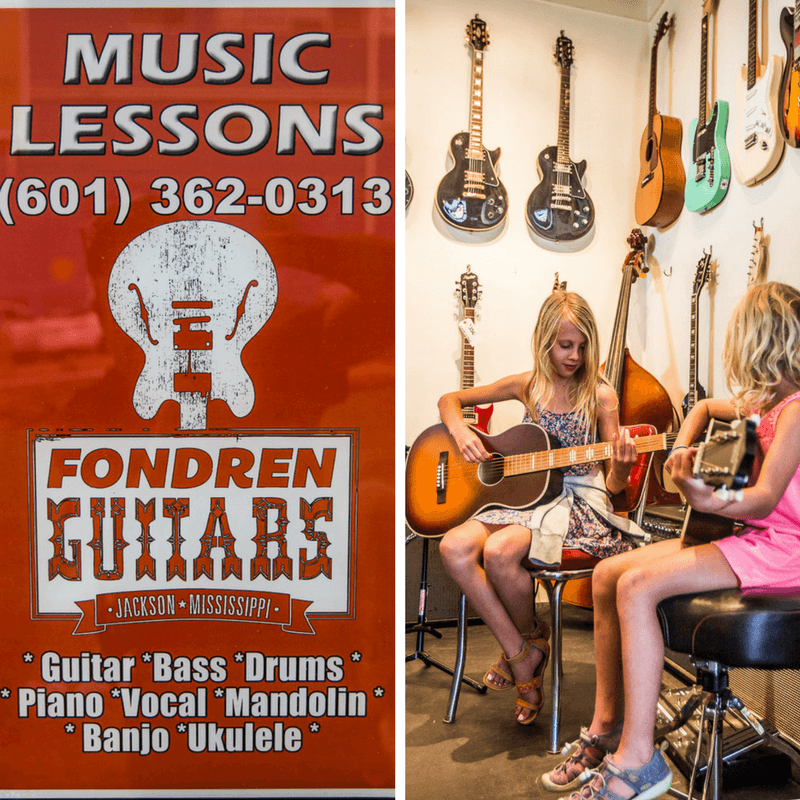 Time to get licking and riffing with a guitar lesson at Fondren Guitars. 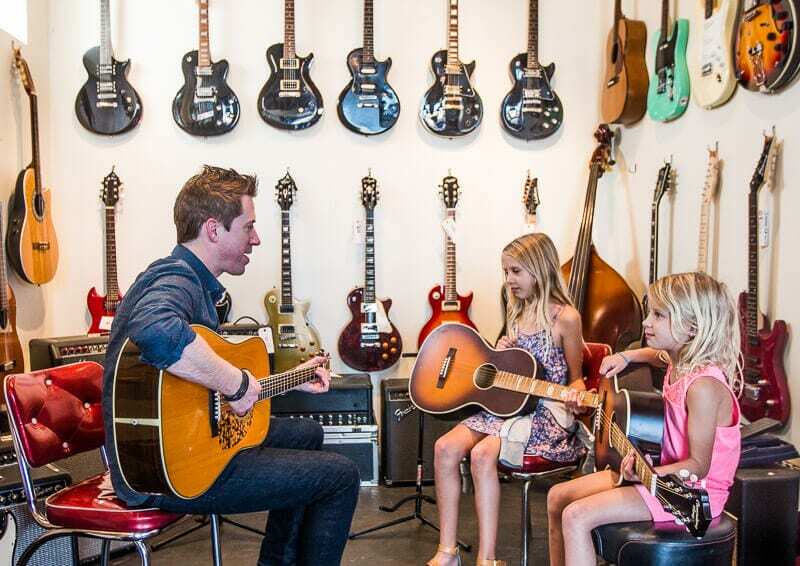 Owner and local musician, Patrick Harkins sat down with the girls to teach them a few simple E chord strums to bring out the blues sound. He was very patient and encouraging and had an artistic, soulful vibe. The girls had fun, and it sounded great. I was hooked listening and, after Savannah’s request for a guitar, I was thinking about throwing one in for myself. Getting a guitar lesson on vacation is something I’ve never considered before. 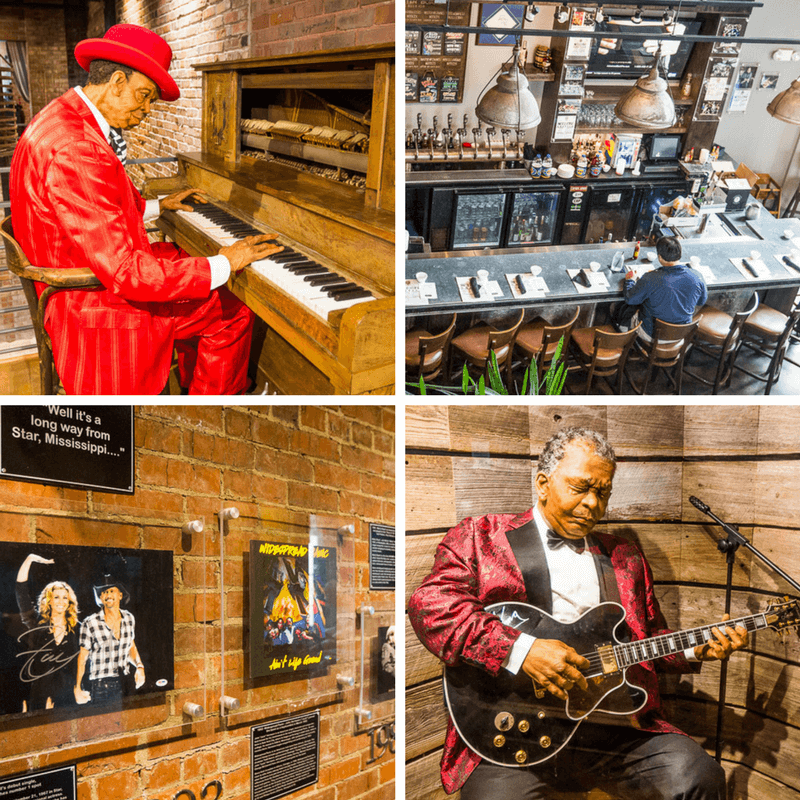 Jackson, Mississippi, the birthplace of the Blues, is the perfect place to have one and is one of the most fun things to do in Jackson, MS. It brings a unique and soulful experience to your travels and perhaps introduces you to a new hobby (or potential career). 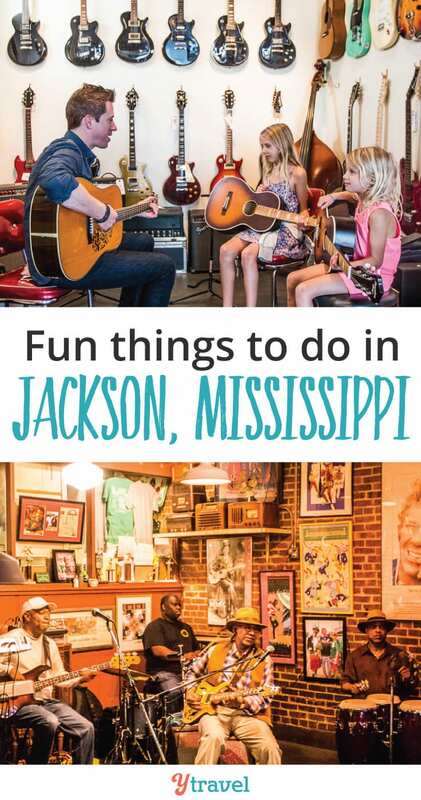 One of the most fun things to do in Jackson, MS if your kids are musical. 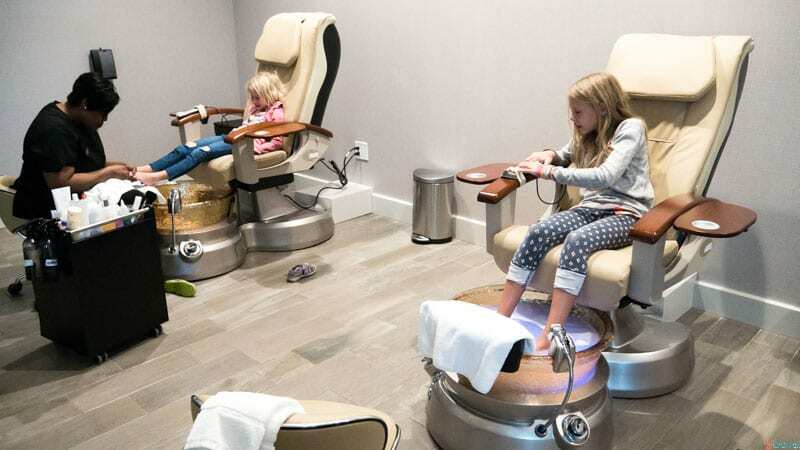 Kalyra and Savannah adored getting a pedicure at the Soul Spa at the Westin Hotel. I think they were made for Southern living. Savannah’s fits of giggles over her ticklish feet was highly entertaining for us all. 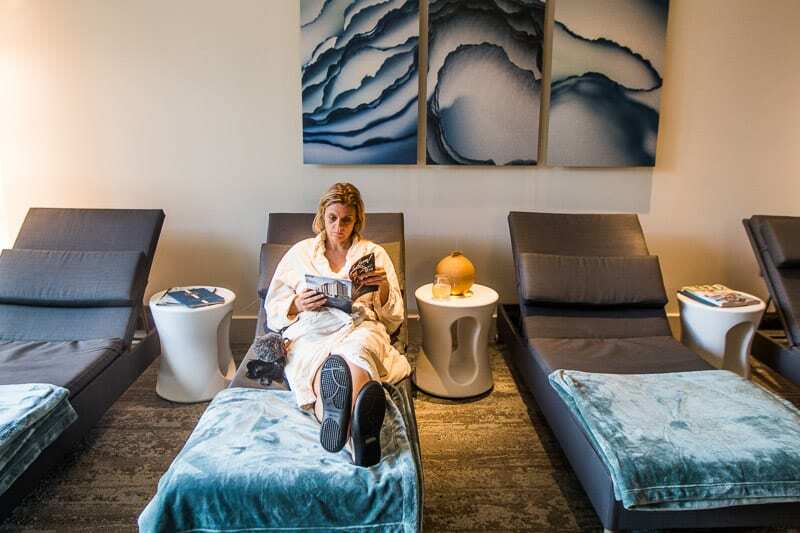 Craig and I ducked back to the Spa ourselves with a therapeutic couples’ massage – yes to instant shoulder tension relief and a divine 80 Soulful personalized facial that left my skin feeling soft and looking radiant. Note to self: do this more often. Carve out a fair amount of time for your trip to the Soul Spa as they have saunas, a tranquil relaxation room, and the best digital shower ever. Ramp up the indulgence on a Sunday with unlimited Mimosas. Yes, puhlease! It’s not all about ham hocks, deep fried chicken, and okra in Jackson Mississippi. 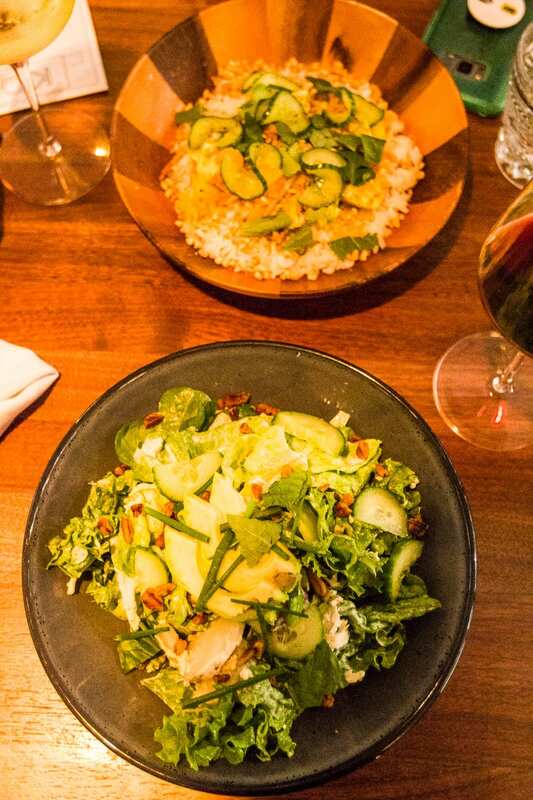 The food has depth and soul with delicious contemporary twists. It was fantastic. Our only disappointment was that we left with several must not miss recommendations left unchecked. Put some pop in your popsicle! Owner of Deep South Pops, Jake Franklin adds creativity and healthy flair to a childhood favorite. They were so good, Savannah didn’t even know there was avocado in her chocolate cake popsicle. 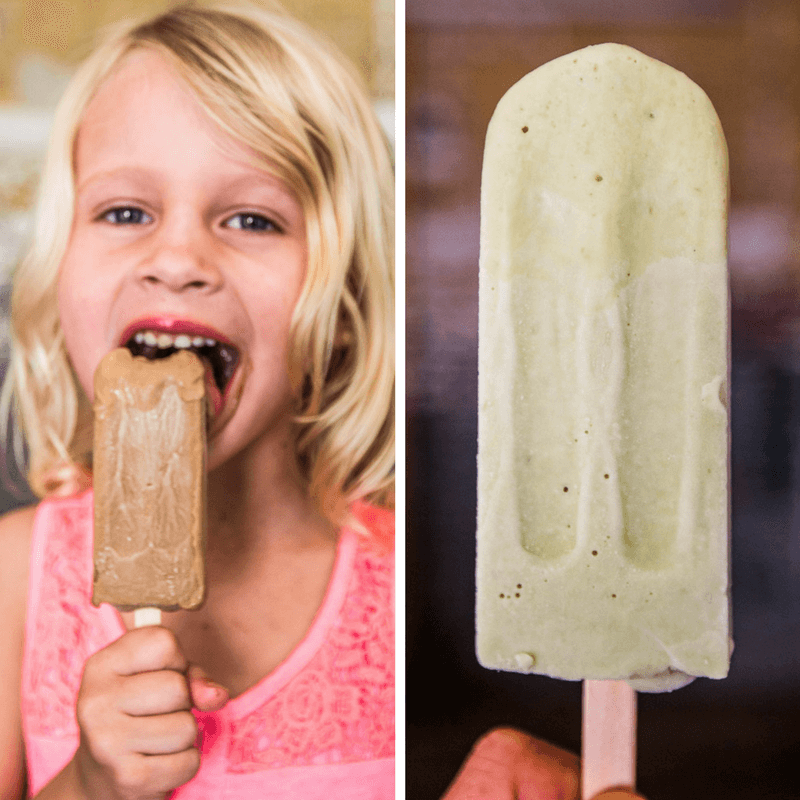 As a lover of all things avocado and coconut my popsicle combining them both over delivered with creamy flavor. And with daily rotating flavors you never have to worry about popsicle boredom. But wait, this treat shop also meets coffee and craft beer shop. Do not miss the nitro lemon and ginger nitro kombucha on tap – it was a creamy deliciousness previously undiscovered in a fermented drink. And my first taste of a nitro coffee went down very well. 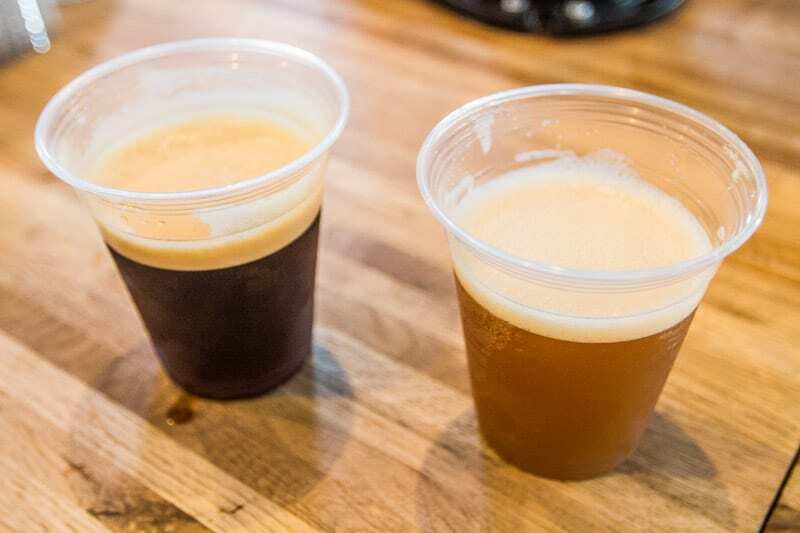 My initial response was that it reminded me of Guinness – that’s because they both came out of the same nitro tap. One will have you bouncing off the walls and the other slurring out the words to Molly Malone. Either way, you’re bound for an enjoyable time. If you want to take your indulgence to a new level, try the beer floats. If I weren’t gluten-free, I’d be all over it. Find a beer and popsicle match, dunk your popsicle in your beer, and away you slurp. Apparently, it’s good for the soul, and I do believe it. 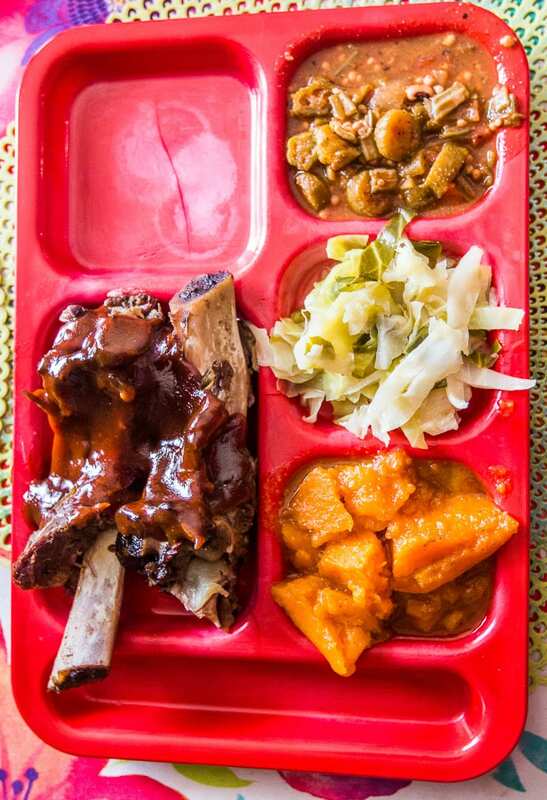 Welcome to a soul food kitchen, that has served its community for over 35 years. From the outside, it’s low-key and humble, but on the inside is some of the best soul food you can have in the South. Bully’s Restaurant received the 2016 James Beard Award for America’s Classic Food. That is a restaurant that has timeless appeal and is cherished for quality food that reflects the character of their community. The Food Network featured their tender and flavorful BBQ ribs and named Bully’s Restaurant #4 on their Top 5 Soul Food Restaurants in the country. You can go crazy with some Southern delights like chitterlings, oxtails, ham hocks, neckbones, turkey wings, meatloaf, macaroni and cheese, and fried green tomatoes. Due to an immensely full stomach after days of good Jackson eating, I settled on a vegetable plate. They were the tastiest lima beans, collard greens and black-eyed peas I’ve ever had. And that cornbread! To die for. 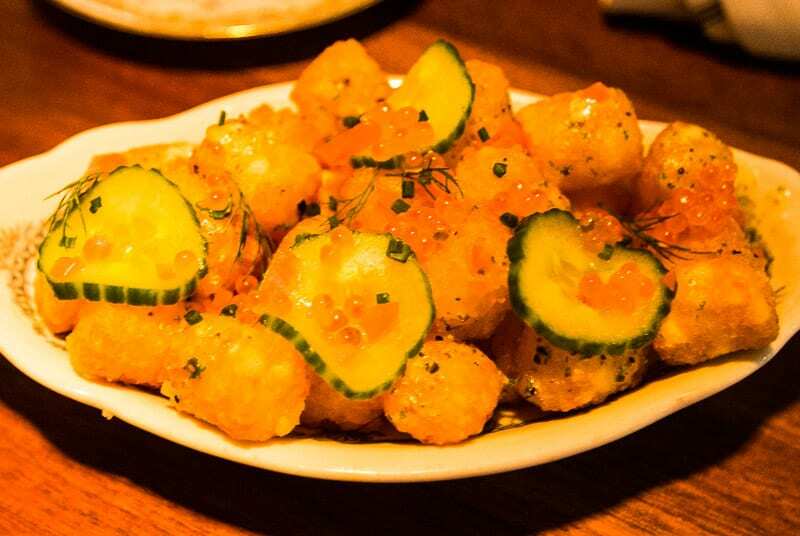 Oh, Fine and Dandy, I will never forget your Tater Tots You Didn’t Make, covered in truffled créme fraiche, smoked trout caviar, pickled shallots, cucumber, dill. You wowed me even more with your Avocado and Mango Salad. I was expecting simple but not bursting with flavor. I don’t know what you did, but I slowly savored every bite to get most of the marinated cucumber, chopped peanuts, cilantro, mint, crispy garlic & shallots, Delta Blues rice, sambal lime vinaigrette. I think you’ve been my favorite meal in America so far. One of the best places to eat in Jackson, MS. The food is classy and innovative with fun names like the worst BBQ ribs in Town, and Tater Tots We Didn’t Make. It offers a lighter, more progressive take on American classics including burgers, snacks, and cocktails. I loved the green space out the front, which is perfect for kids while the parents eat and relax. Fine and Dandy just is. 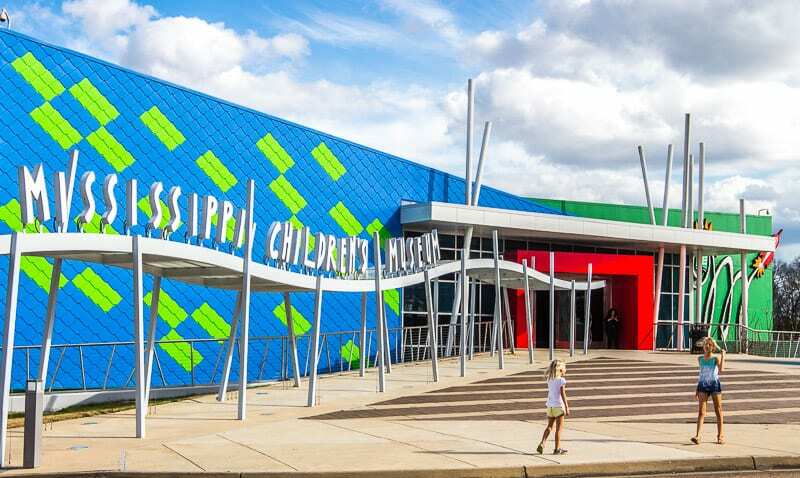 Another one of the most fun things to do in Jackson, MS, if you’re looking for a treat for the kids, and you! 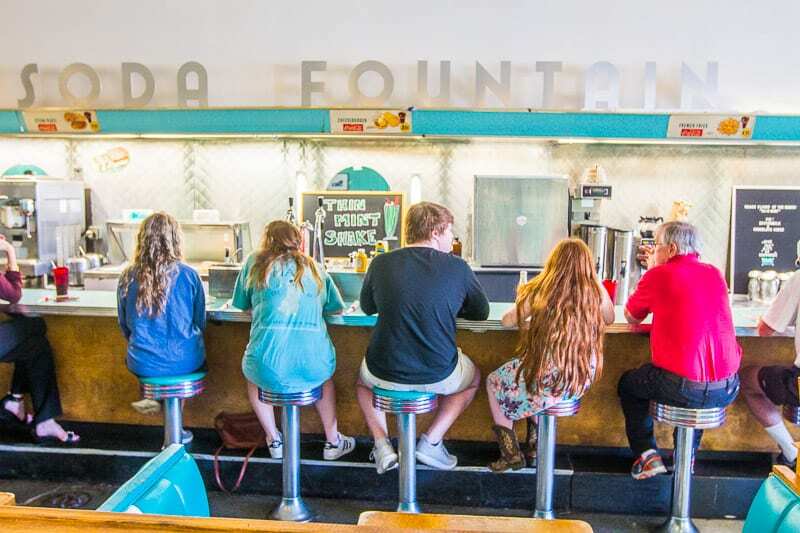 Brent’s Soda Fountain has been operating since 1946, and happily maintains its old-school soda fountain style. It was originally a pharmacy that served milkshakes to ice cream to the community as they waited for prescriptions to be filled. In 2009 it opened as a diner serving burgers, hot dogs, and other family favorites. 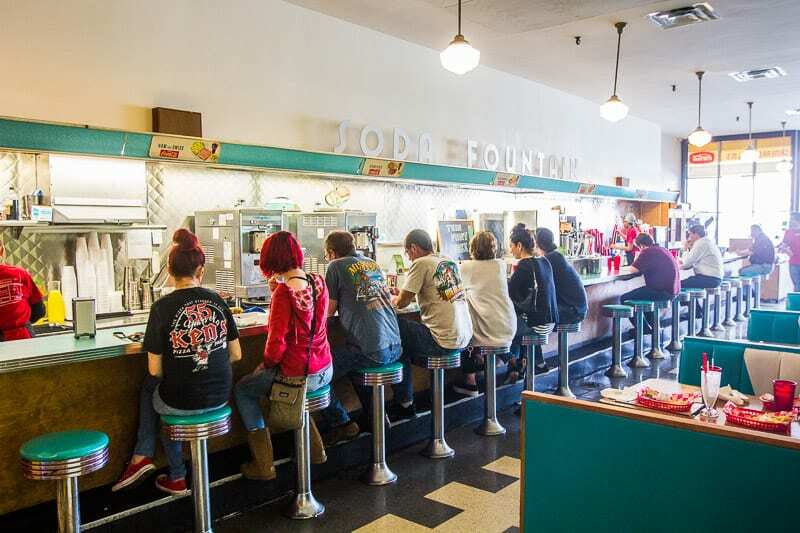 The soda fountain and classic bar stools remain in the original 1946 location, but the kitchen now sits where the pharmacy once was. 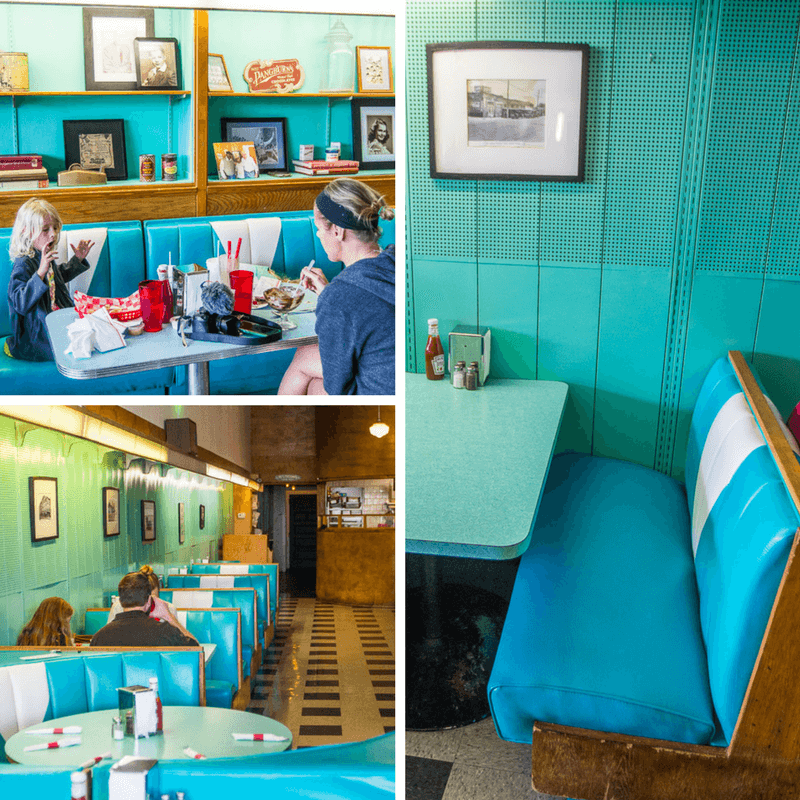 I loved how Brent’s retains the retro 50’s charm with its turquoise and chrome decor. It oozes southern hospitality. The movie The Help was filmed here. 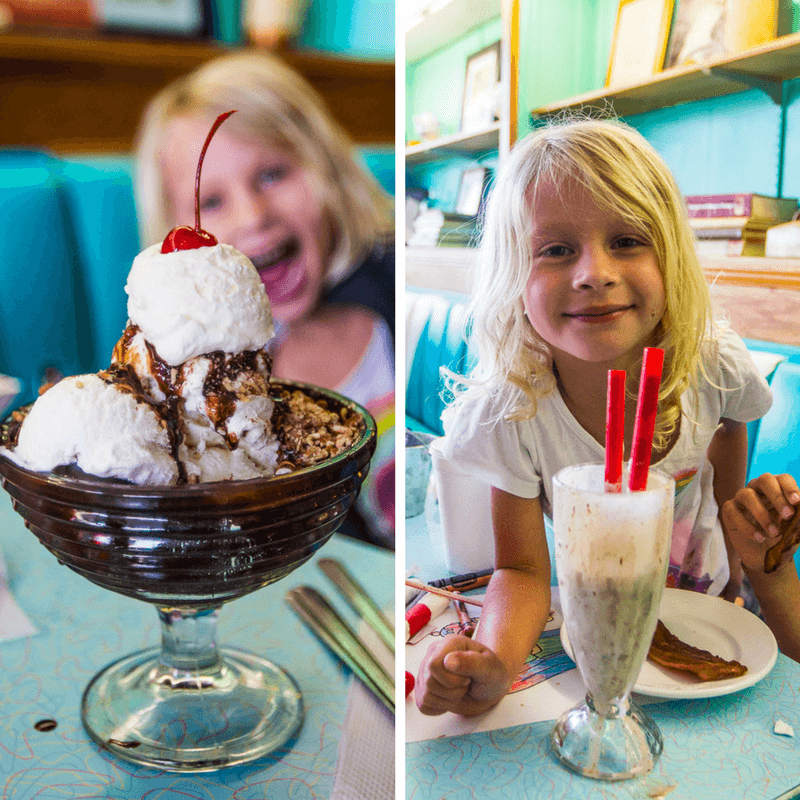 The hot fudge Sundae was nostalgic to my childhood, and the Nutella milkshake the girls chose was just divine. Parents, if you can manage to find a sitter for the kids, sneak out the back door to the Speakeasy hidden in the back of Brent’s. Apothecary is a small, intimate space which maintains its old pharmacy feel with the old medicine drawers making a feature wall behind the bar. You can order your medicine of choice and sip your libations in what has where you can sip your libations in what has been noted as one of the best cocktail bars in the South. 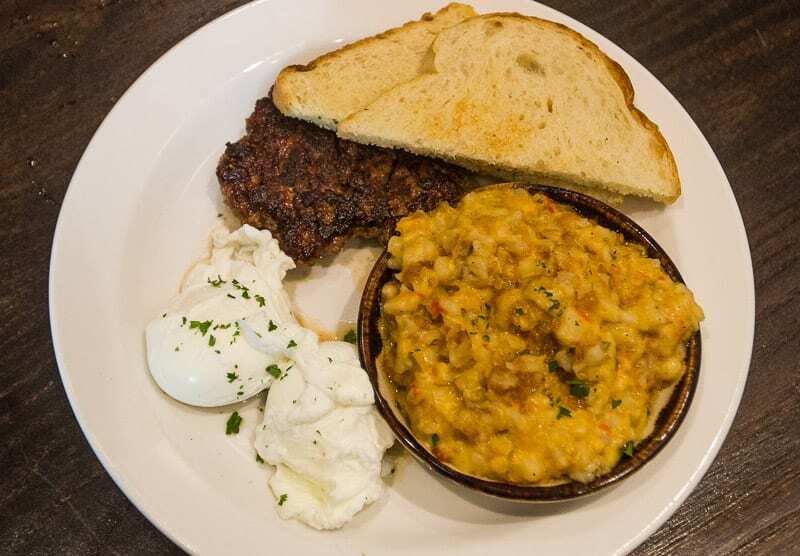 I was hesitant to order duck for breakfast, but I’m so glad I took the plunge to add another dimension to the Soulful food experience we were having in Jackson. 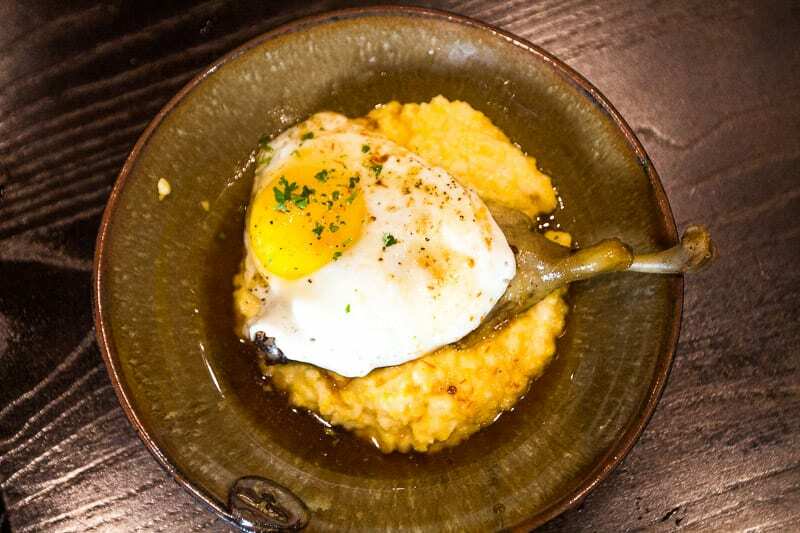 The duck leg over polenta, maple glaze, and fried egg was one of the best breakfast’s I’ve ever had. I could not get over how something so simple, yet unique could deliver so much intoxicating flavor. I snuck a spoonful of Craig’s southern smashed hash browns which were so creamy and delicious. It’s an eclectic menu that is seasonal and locally sourced where possible. 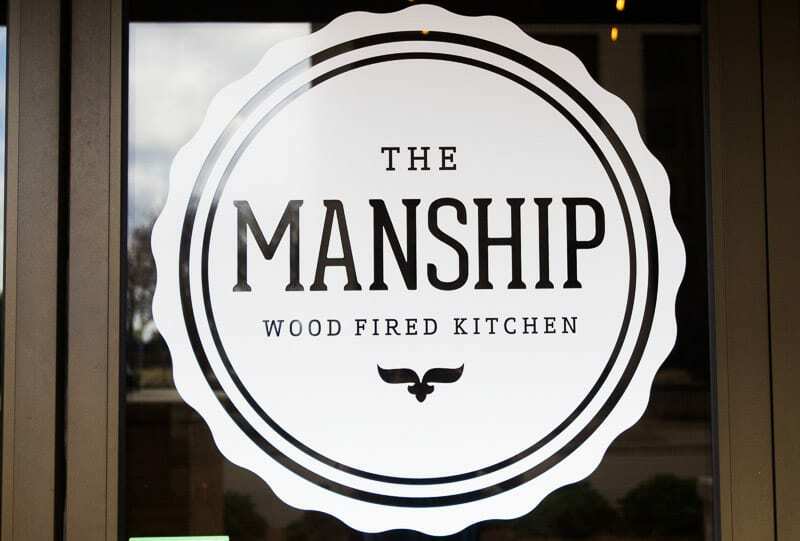 The Manship is in the historic Belhaven neighborhood and is an entirely wood-fired kitchen, because as they say, without flavor how can you ignite? One of the real locals favorite restaurants in Jackson, MS. 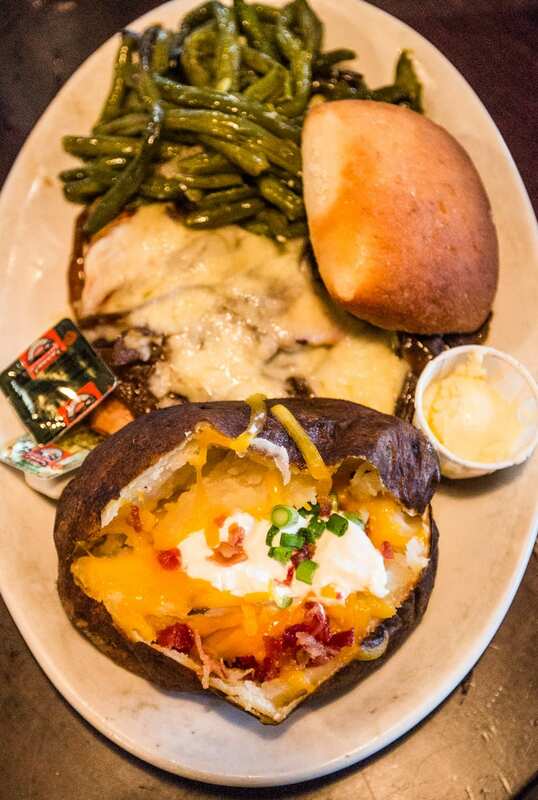 The Iron Horse Grill has a rich heritage in Jackson. Having been built as the Armour Smokehouse in 1906, it became the Iron Horse Grill restaurant in 1986, but mysteriously it burned down twice before being abandoned in 1999. 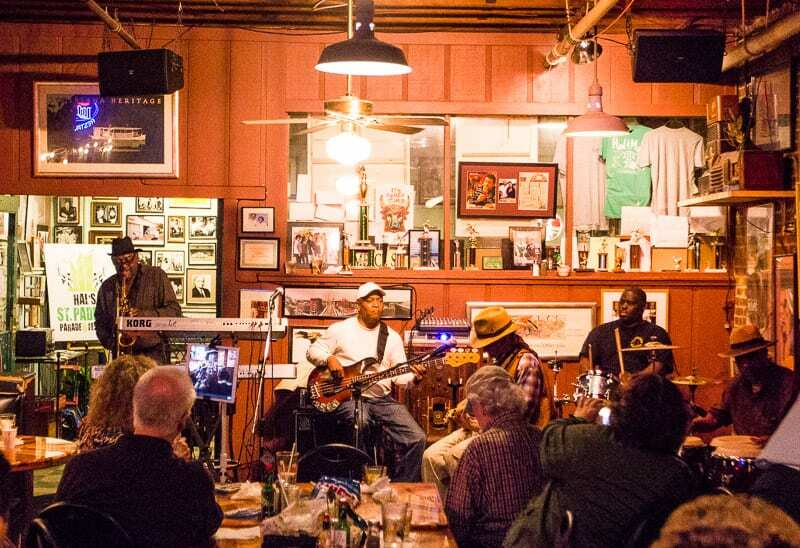 In 2013 it rose from the ashes again when a group of locals committed to restoring its former glory serving up food and music to the people of Jackson. We went with The Iron Horse signature dish the Navajo Chicken, breast grilled over open fire with sautéed mushrooms & onions and topped with monterey jack cheese. You can choose from a wide variety of burgers, sandwiches, salads, and fajitas and they have a Sunday brunch of waffles and omelets. 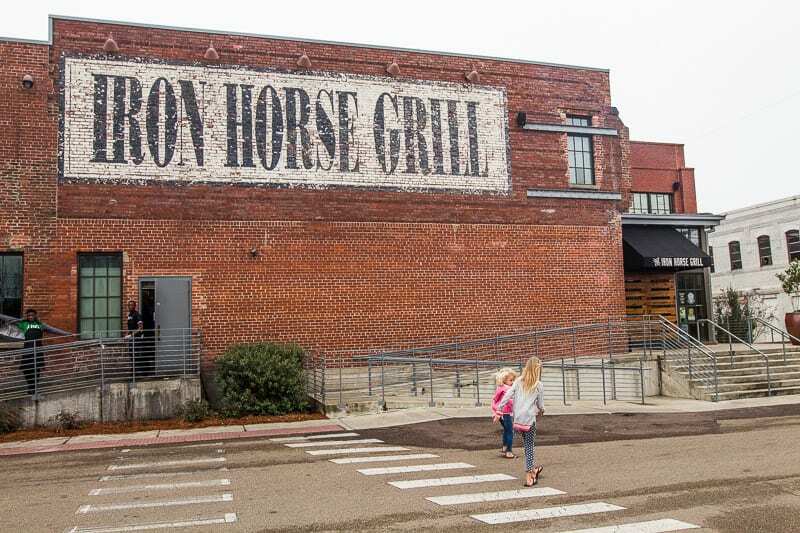 Live music is frequently performed on the stage at the Iron Horse Grill. We enjoyed some Sunday Jazz over our brunch. There’s also a Mississippi Music museum on the second floor which is a tribute to the deep roots of blues music in the state. There’s a timeline hall starting in the 1800,s to the current music scene, with unique life-sized wax models depicting the musical story. 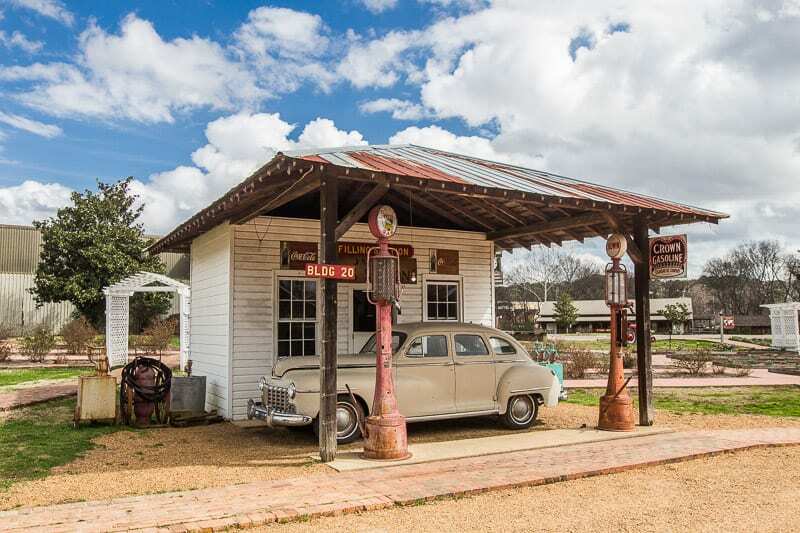 It’s a stop on the famous Mississippi Blues Trail. Sal & Mookie’s was made for families. I got this as soon as I walked up the steps to the front door. Teams of teens crowded around the front patio gossiping and indulging in giant ice creams. The line was long and the tables full of families happily gorging on gigantic, New York style gourmet pizzas. 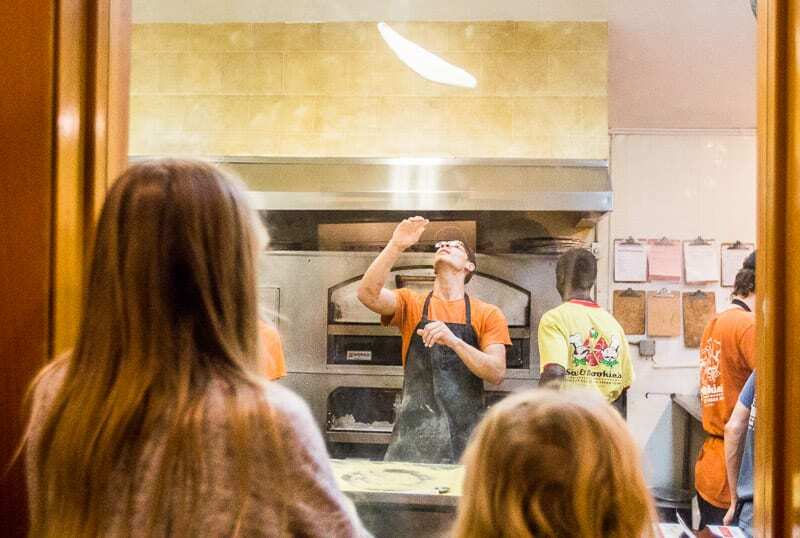 Don’t worry if you have a bit of a wait – it’s worth it – but you can pass the time watching the chefs mold, spin and flip the18 inch pizza bases from the window looking into the open-air kitchen. I’m telling you, there is some pizza being made each day at Sal & Mookies as we saw a lot of pizza spinning into that brick-lined oven and there was no time for pausing. 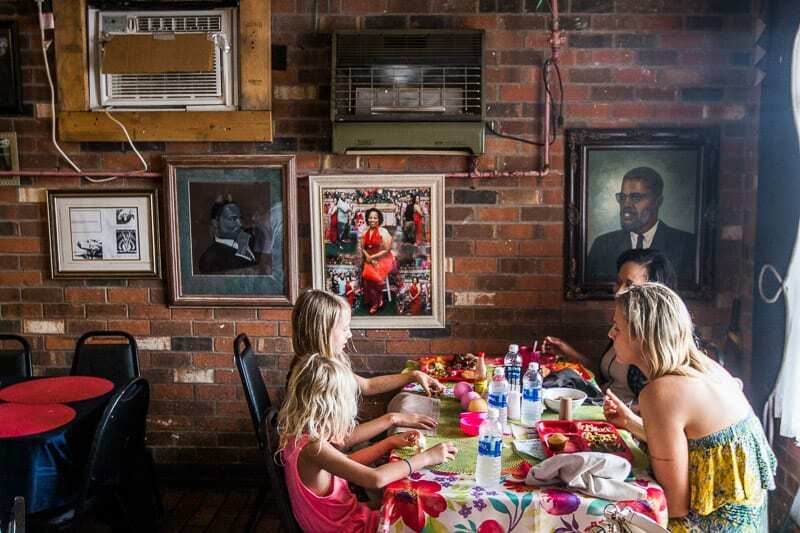 You can be as loud as you like with your kids here, you’ll be right at home, and the service is that warm Southern style you’ve come to expect traveling in the Deep South. It’s a shame it was raining as sitting out on the deck would have made it a perfect evening. 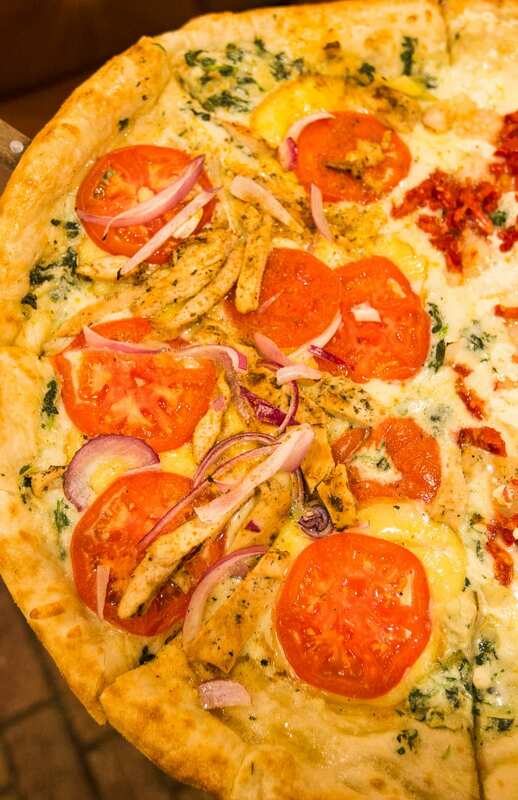 We recommend the Franklin Street pizza with creamy spinach & artichoke spread, grilled chicken, jalapenos and creole seasoning and the Upper Westside with feta shrimp and sun-dried tomatoes. 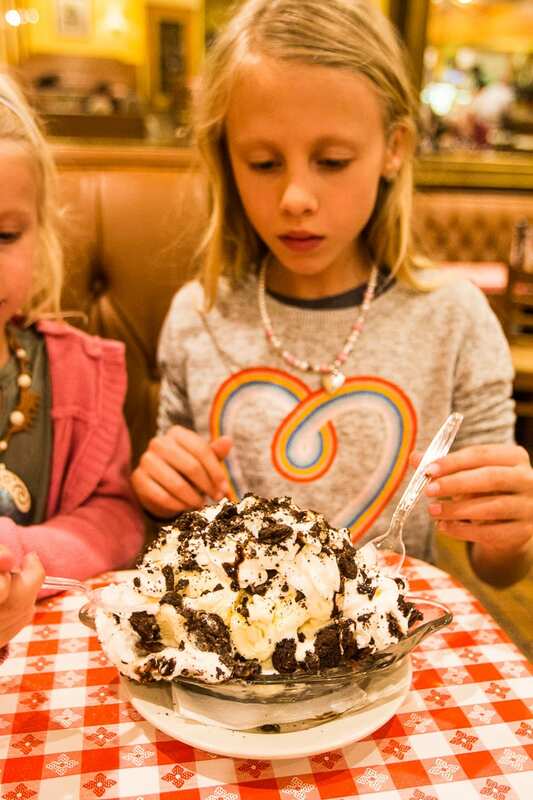 And for the kids, you can let them indulge in a Double Stuffed Oreo supreme sundae or line up at the ice cream counter to choose their favorite scoop. Okay, adults, you can too. 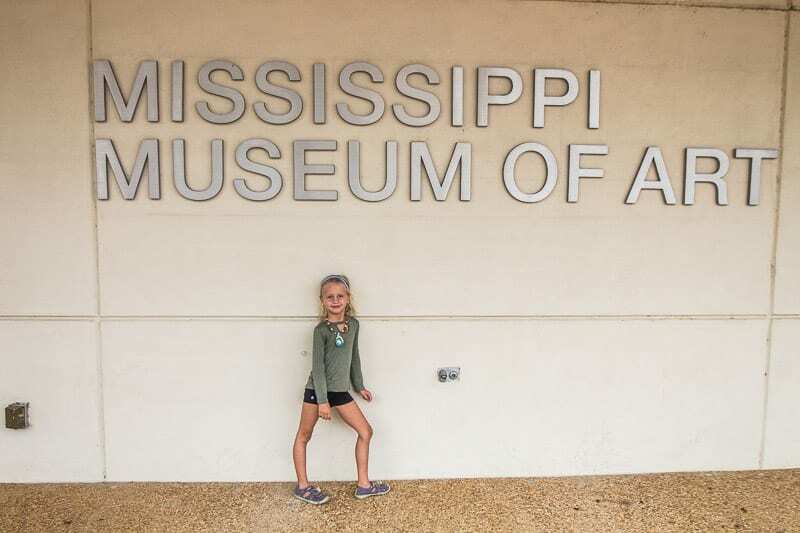 One of the best things to do in Jackson, MS, with kids. Char Restaurant is a classy steakhouse joint that serves contemporary Southern cuisine made from the highest quality ingredients in a warm and welcoming atmosphere. We enjoyed a delicious three-course meal in a private room while host, and local magician, Joe Presto shared some mind-blowing magic tricks. The girls loved the show and have since been practicing how to turn a fork into a spoon. It’s an experience they’ll always remember of Jackson. Broad Street Bakery is owned by a family who has been baking bread for generations with old-world recipes passed down from Eastern Europe. 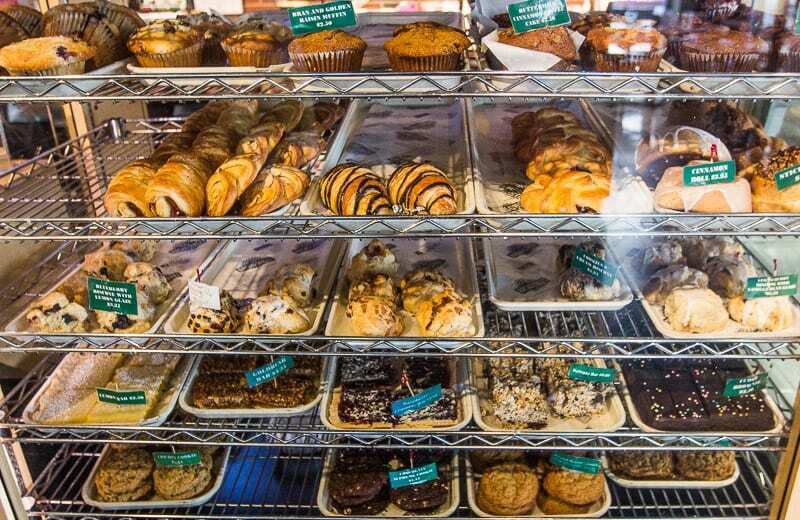 All their pastries, bread, desserts and cookies are made by hand. They even bake gluten-free bread! 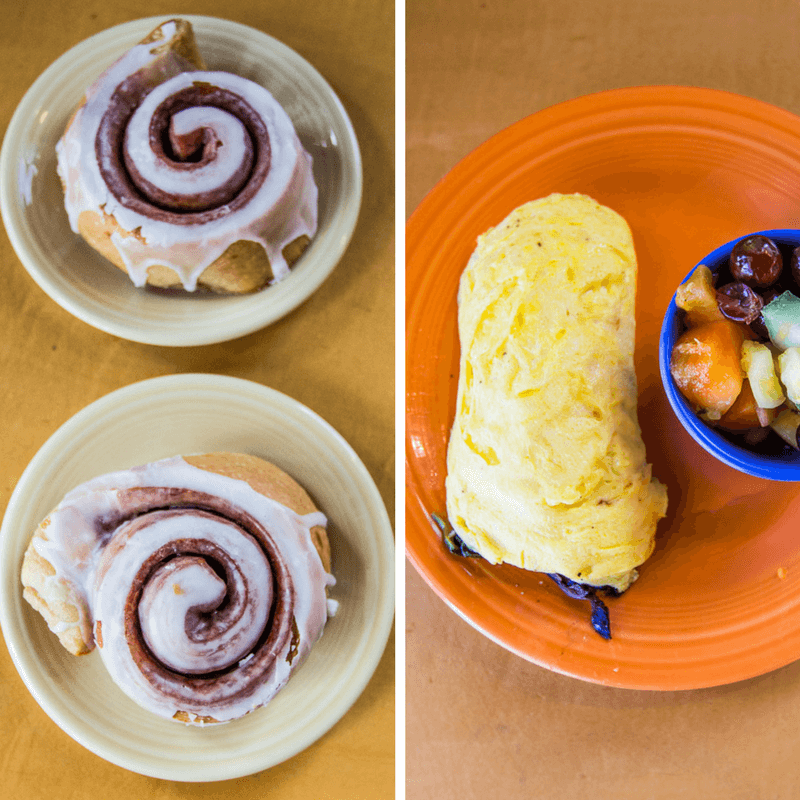 You can pop in for a sweet baked treat (such as our girls favorite, cinnamon rolls), or for some paninis, burgers, ,pizzas and omeletes on their extensive menu. We visited for breakfast and my recommendation to start the day is delicious spinach, Portobello mushroom, and goat cheese omelet! 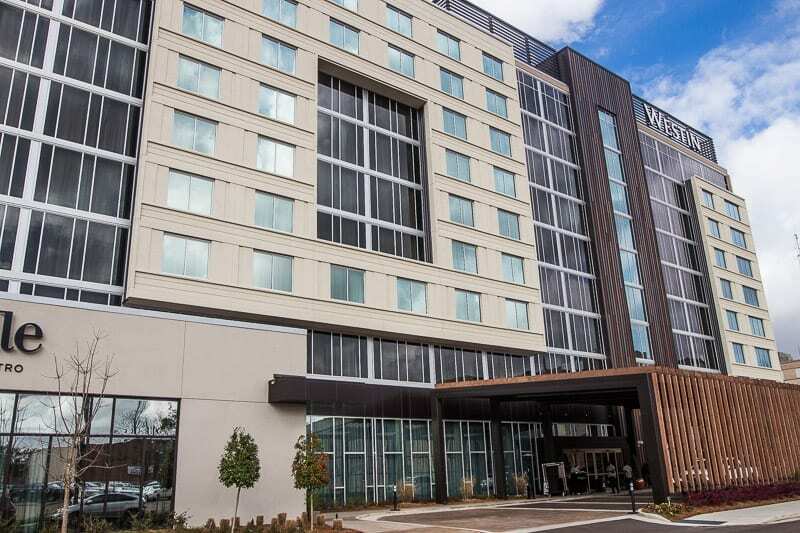 At only 8 months old, the Westin Jackson is the newest of hotels in Jackson Mississippi. And like most things in Jackson they have perfected the art of Southern hospitality and style. We thoroughly enjoyed our four-night stay here. It was comfortable and classy and the service friendly and efficient. Over the past few months, I’ve morphed into someone who cares about fitness facilities in our accommodation. I’m training hard every day at our local gym so don’t want to lose the routine or habit. The fitness center at The Westin was large and came fully equipped with everything I use for my fitness and weight training regime. There is also an indoor pool which the girls enjoyed, an onsite restaurant, and of course, the divine Soul Spa. 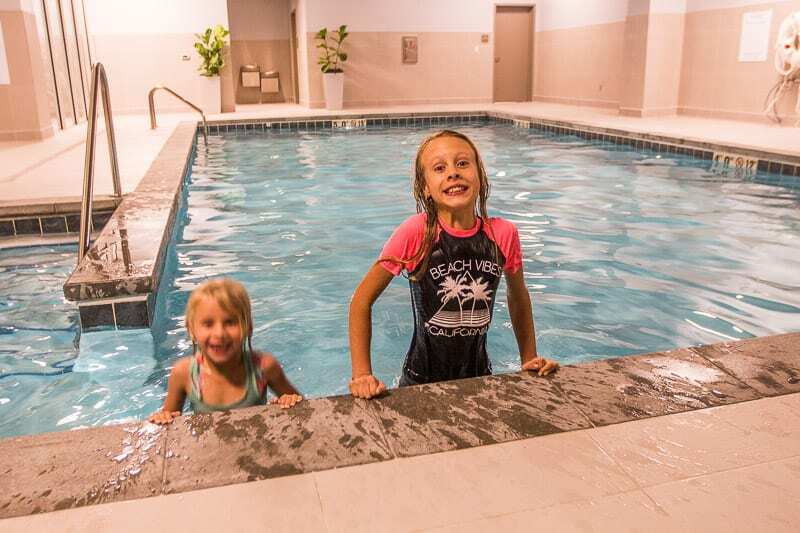 We’d stayed at several hotels before The Westin in Jackson on our Deep South road trip, and the fitness centers were small and lacking in some of the equipment I wanted. To learn more about the fun things to do in Jackson, MS, don’t forget to check out the docuseries showcasing the City With Soul and what makes it so unique. Always love going through your blogs. And this one is simply amazing. Loved the captures and all the incorporated information. Cheers! Hi Caz, Craig and the kids, loved my armchair travels with you, having a cup of tea and enjoying a break from work. Your blog posts are so comprehensive, and I feel I’d know exactly where to go and what would work for my own kids… the Civil Rights Museum would be the first stop. Now I am not sure that Jackson is on an imminent travel plan, but you never do know… a trip to the USA is though and perhaps the South shouldn’t be missed rather than the usual east and west coast suspects. A few miles north east of Jackson is Philadelphia, ms. This is the original home of the Native American tribe of Choctaws before they were forced to leave their homeland by President Andrew Jackson. There are many museums there as well. My daughter will be participating in a Trail of Tears bike ride from Philadelphia, Ms to their headquarters in Durant, ok, starting next week. Thanks for sharing that about Philadelphia, MS. We hope to explore more of Mississippi in the future!